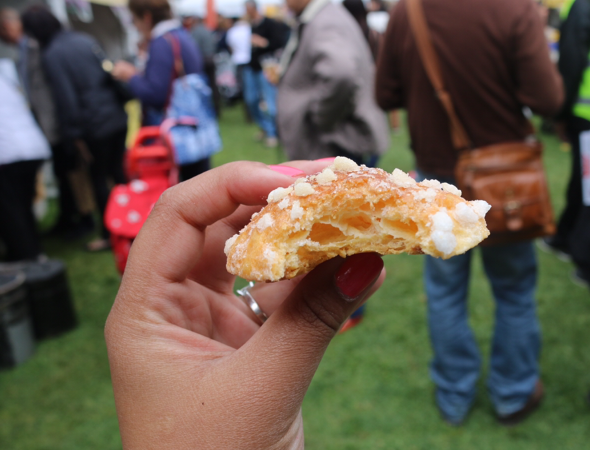 If you’re a major sweet tooth, Sweetfest is your kind of festival. 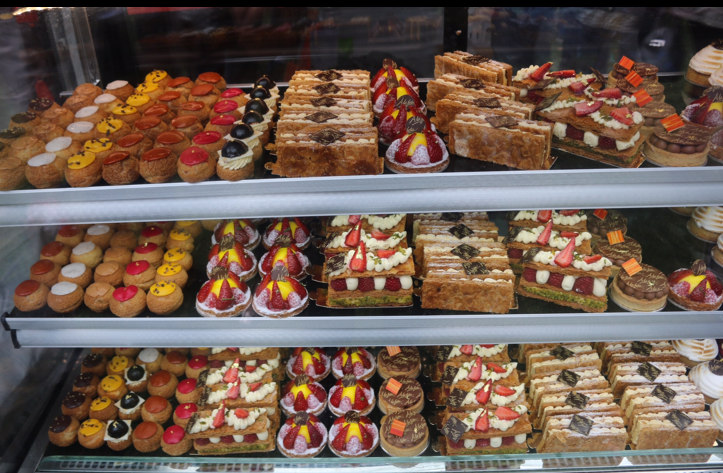 It houses lots of renowned patisseries, ice-ceameries, chocolateries, donuteries. Ok now I’m just making up words, but you get the point. There is a plethora of sweetness all in one place, ready to be eaten in abundance. Hoy Pinoy had a sweets stall. 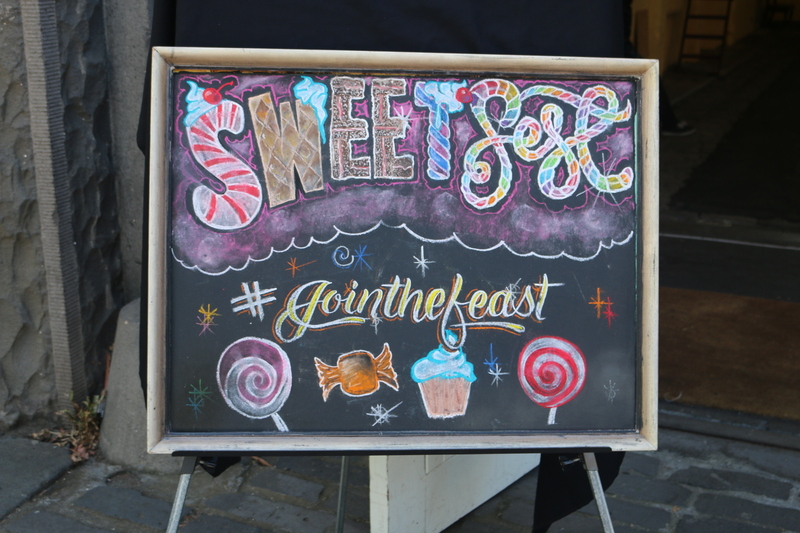 We know them for their tasty Filipino BBQ but at Sweetfest they had a range of Filipino sweets. They had two types of puto, which is a sweet steamed cake. 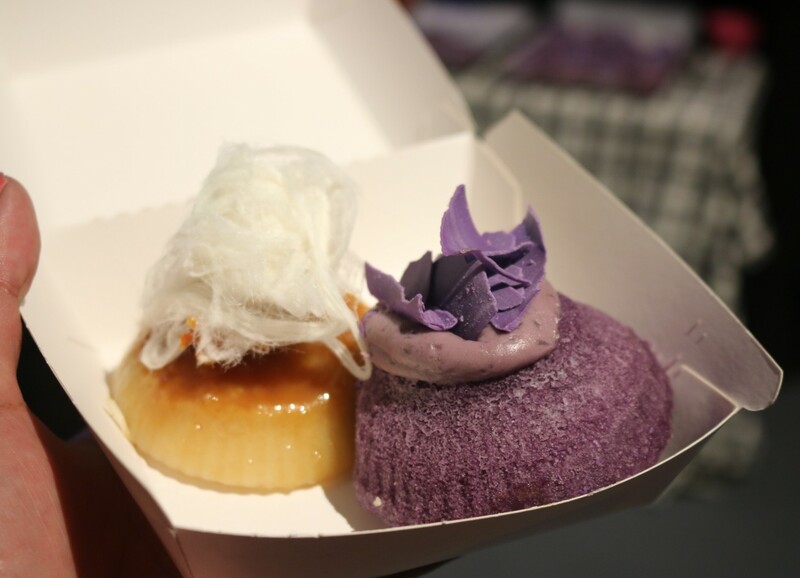 They had Ube (Purple Yam) and coconut caramel with fairyfloss. They were soft, sweet and delicious. 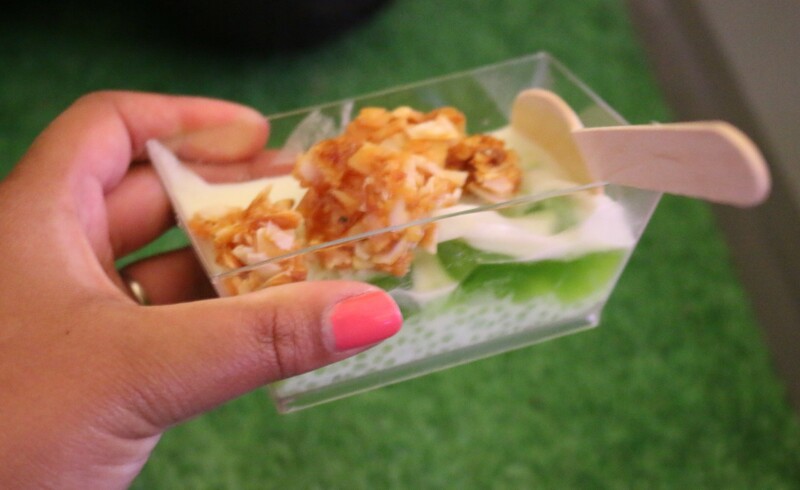 We also had the sago dessert, which had pandan jelly, coconut cream, coconut pieces and crunchy caramel coconut clusters on top. Delish. 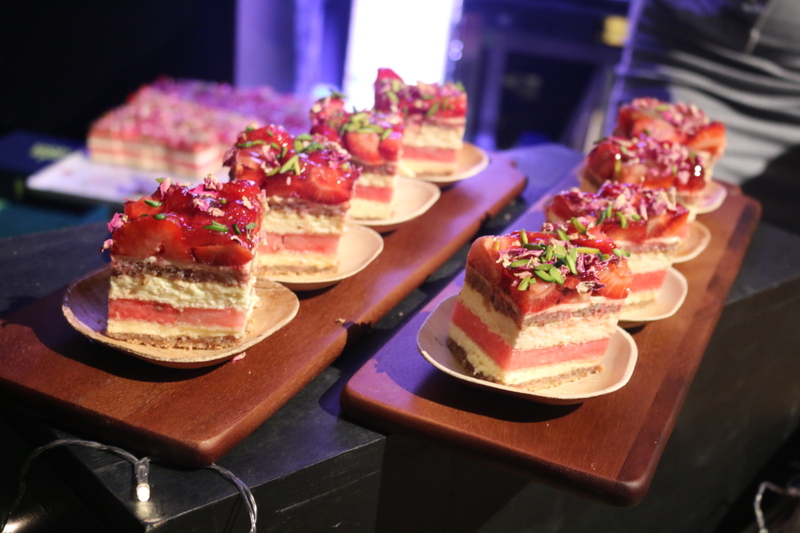 Black star pastry had their famed strawberry watermelon cake, which is popular because it tastes really good. It has a lovely balance of freshness, tart and aromatic tones from the rose petals. They also had peach, blackberry and lavender tarts, which were tasty, the pastry was buttery and short and the filling was fruity and floral. 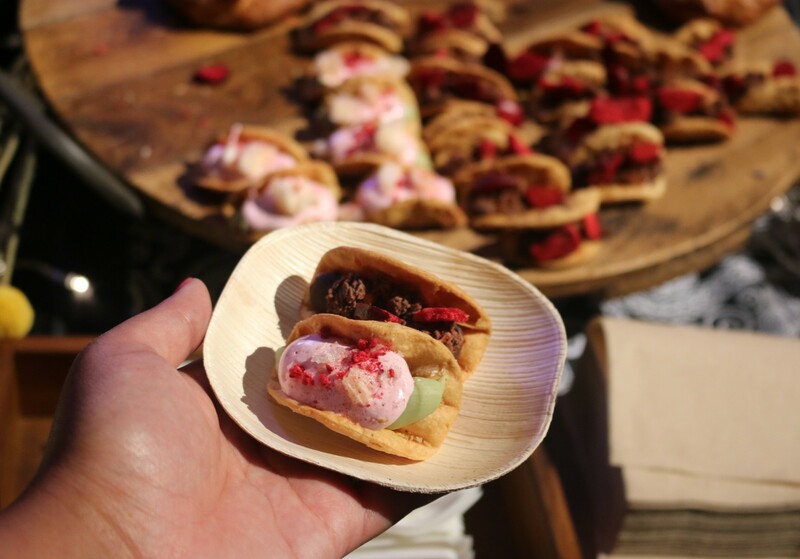 We also had the sweet pastry tacos. One had chocolate ganache and raspberry and the other had marshmallow and green tea ganache. They also had a lemon meringue one that had sold out. They were cute. 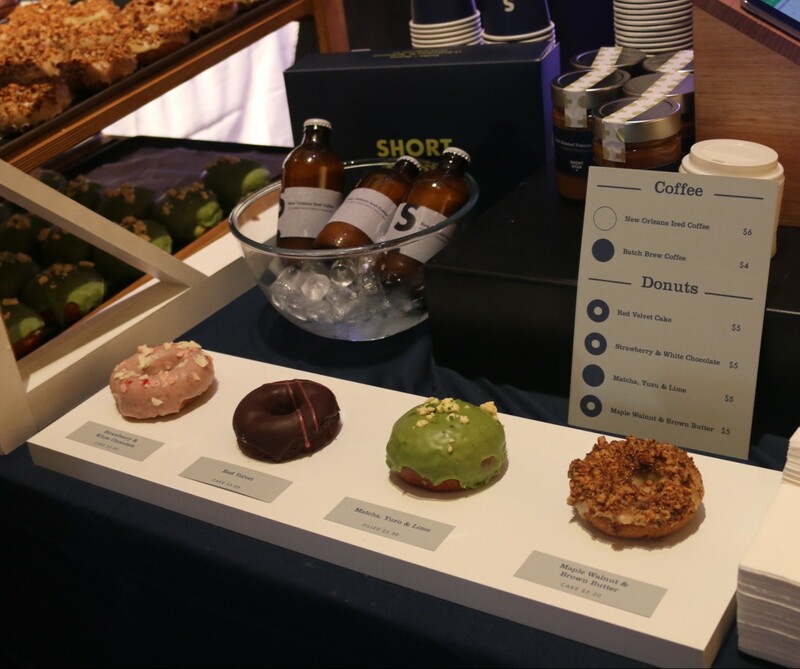 Shortstop had a special range of donuts created just for Sweetfest. They had a maple walnut brown butter, matcha yuzu lime, red velvet and strawberry crumble available. The scrolls at Oregano bakery were delicious. We had the cinnamon, cookies and cream and nutella banana. And they were all great. Perfect with a cup of tea. 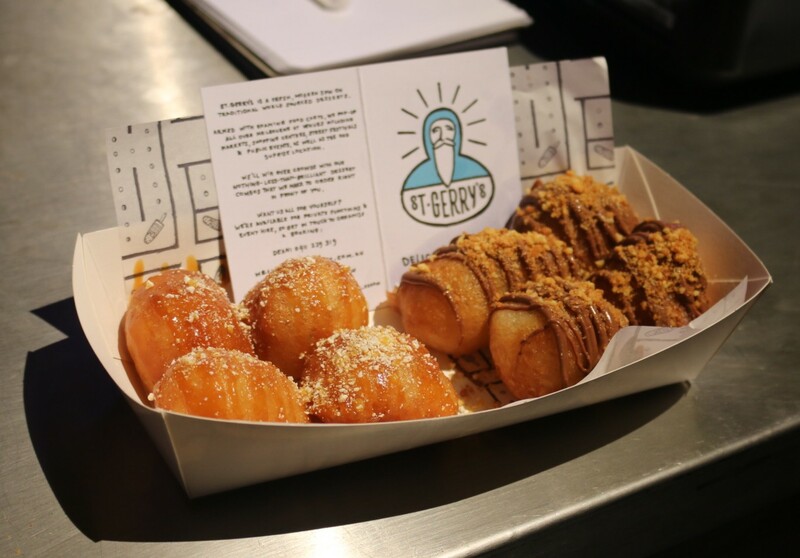 St Gerry’s had a range of loukoumades (greek doughnuts) with different toppings. They were delicious crunchy deep-fried dough balls with different toppings. On entry you receive a ticket for a complimentary glass of Redbank Emily Brut Cuvee which was nice. They also had some of St Gerry’s greek doughnuts filled with white peach and presseco jelly. 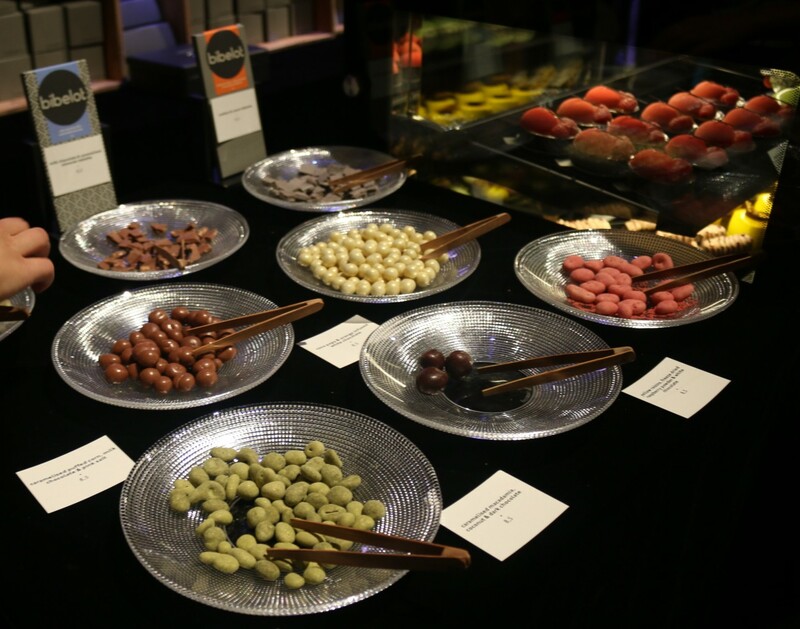 Ganache had a range of thier specialty chocolates. 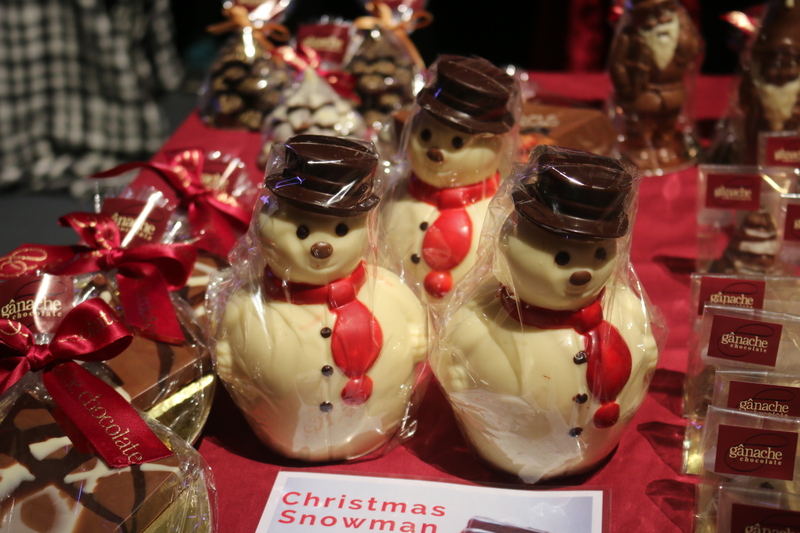 They had these really cute chocolate snowmen for Christmas. They had a Gelato Messsina truck, unfortunately the mini magic mushroom cake was sold out but we got to try the ‘such a fairy’ paddle pop. It was toast and butter gelato covered in white chocolate and dipped in Big Gay Icecream’s fairy bread sprinkles. 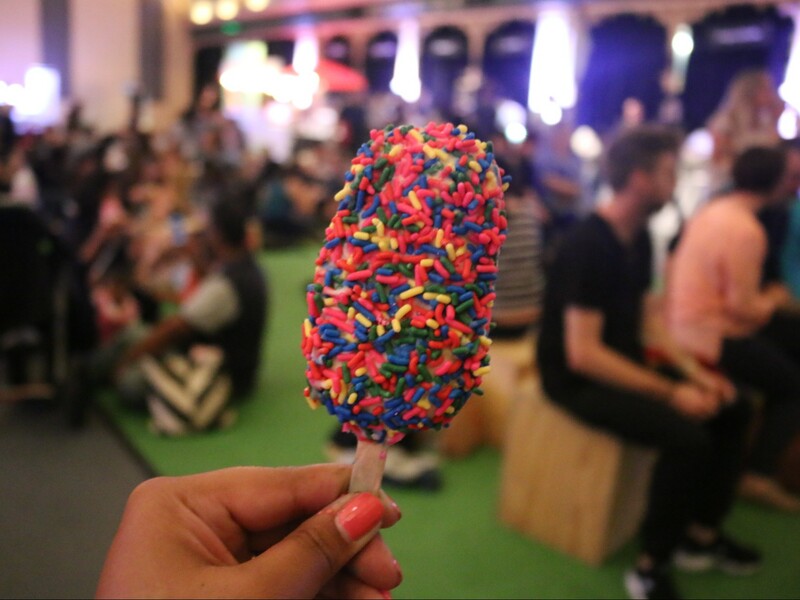 Besides the fact that it didn’t taste anything like the fairy bread I know and love, it was a nice sweet icecream pop. They also had N2 Gelato serving their Ferrero reveal, which is like a gelato version of a Ferrero rocher and Gelato Tino that had interesting flavours like raspberry and rosemary. 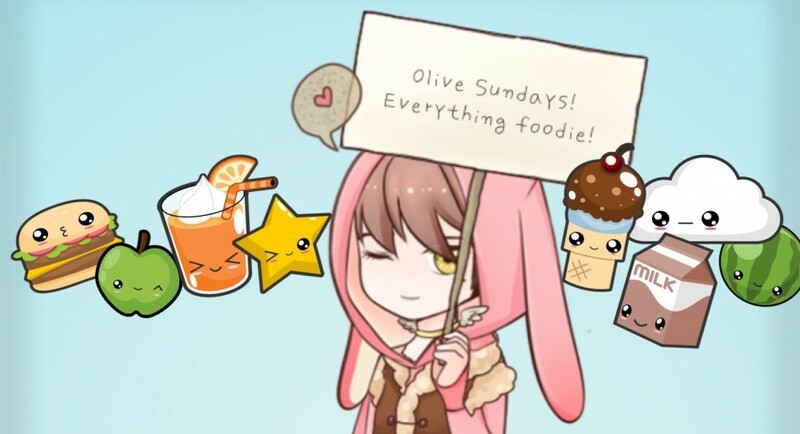 After eating too many sweets (there is such a thing) you get to the point where you just want something savoury. 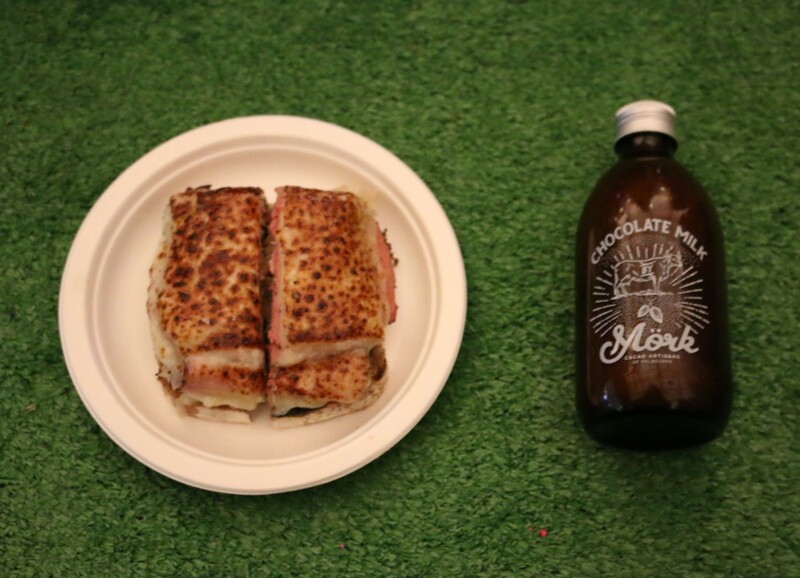 Luckily Maker and Monger had a stall and they were pumping out a range of savoury toasties. We had the flaming Rueben. 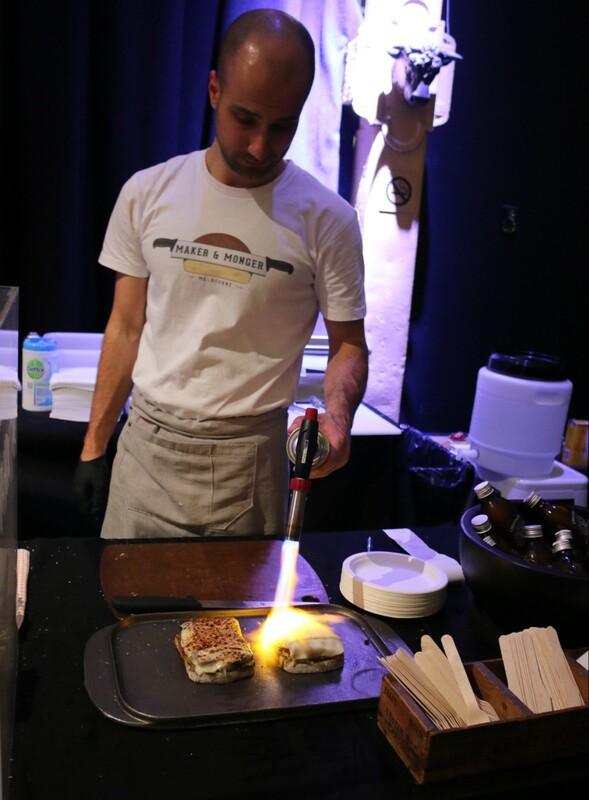 The guy literally blow-torched the cheese right in front our faces. The melted cheese oozing over the top of our sandwich looked amazing. The Rueben was delicious and was a perfect retreat from all the sweetness. It was salty and sour and cheesey. Loved it! We also had Mork chocolate milk. 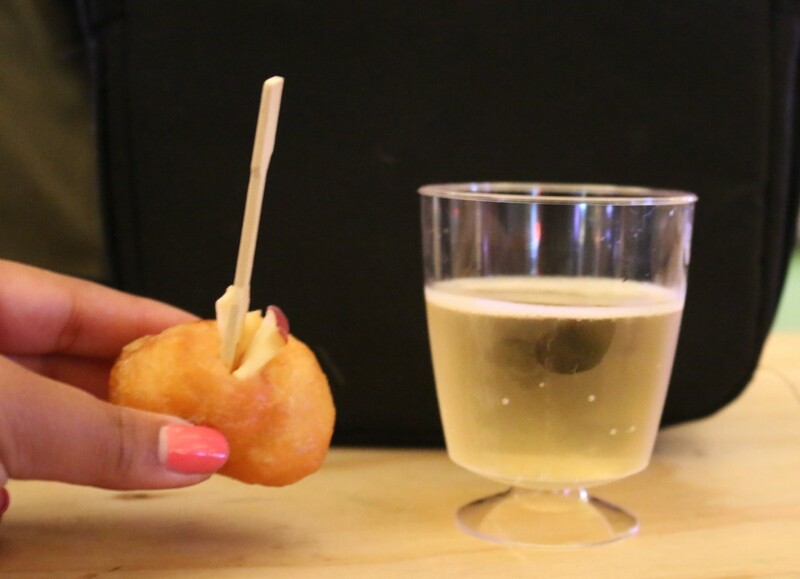 We figured we couldn’t have a savoury dish at Sweetfest unless it was accompanied by a sweet beverage. The mork chocolate milk was cold and chocolaty. The Rueben reset our palettes so we could continue on eating plentiful amounts of sweets. 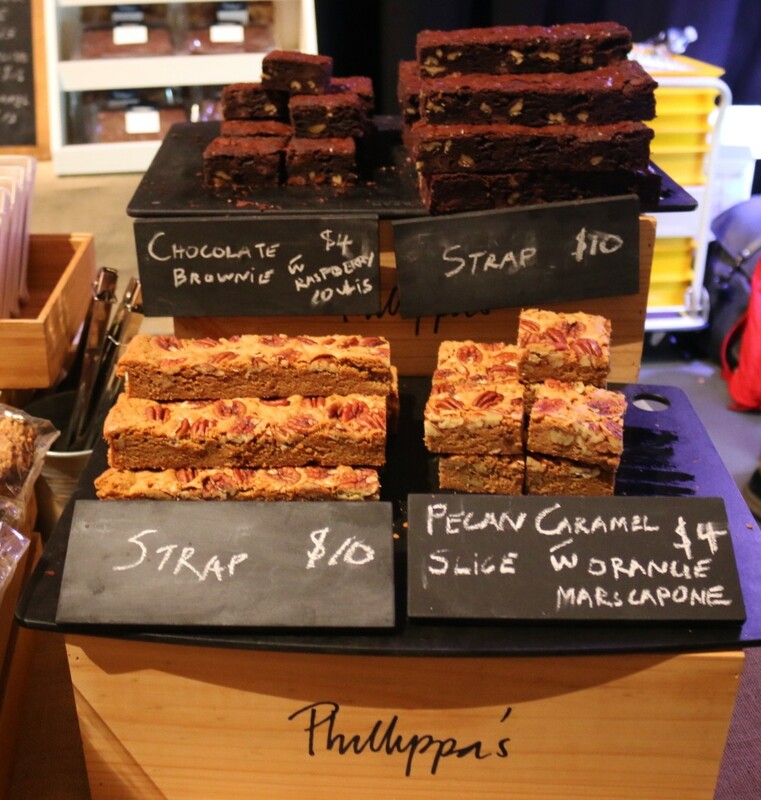 Phillippa makes amazing bread but turns out she also makes amazing sweets. The pecan caramel slice w orange mascarpone was fab. One of my faves. It tasted buttery and brown sugary with caramel and pecans. Lets just call it amazing. I ate it on the drive home and I wished I had eaten it earlier at the event because then I could have bought more. There was lots to do throughout the day, master classes, book signing etc. 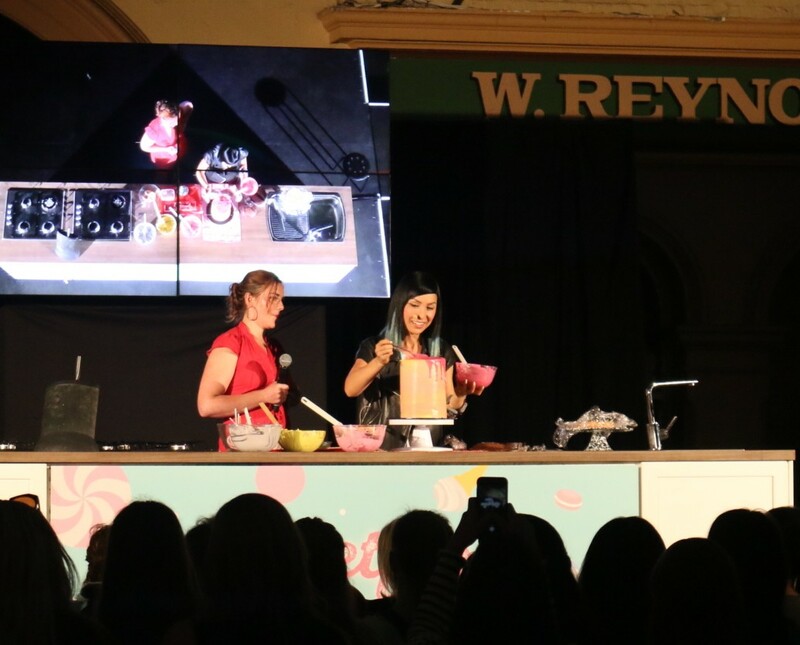 We got to see the talented Katherine Sabbath live on stage making one of her creative multi coloured drip cakes. They look so awesome and she makes it look super easy. The Naughty boy café had a mega choco lova shake. It was a chocolate milk shake with all the trimmings. 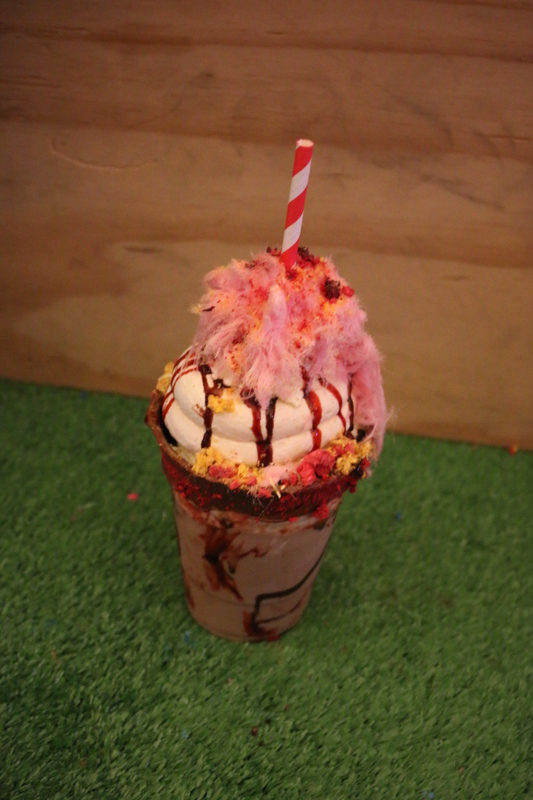 It had Nutella around the cup with chocolate sauce and strawberry sauce, meringue, dehydrated fruit crumb and Persian fairy floss. They looked pretty epic. 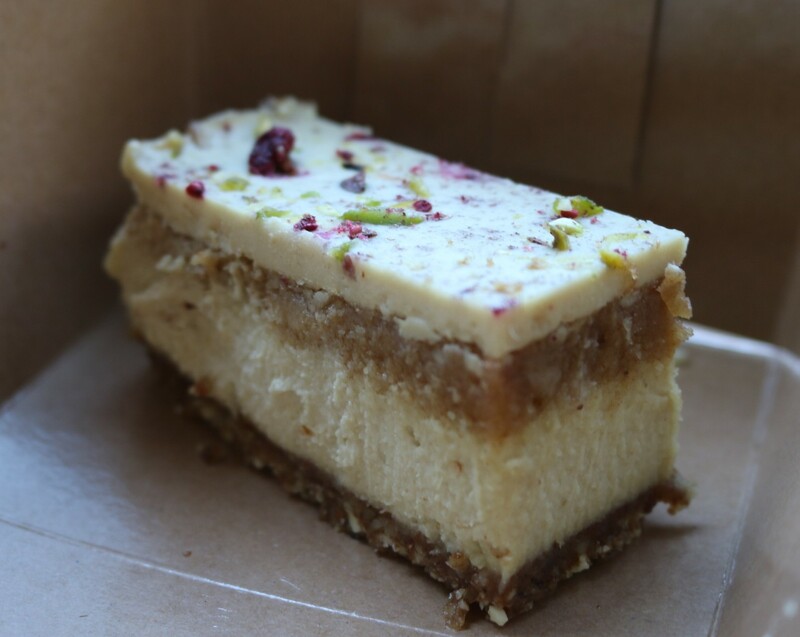 From Raw Trader we had the white chocolate and salted caramel slice. It was sweet and creamy and the base had a delicious crumble. I know it had white chocolate and salted caramel but it’s probably the healthiest thing I ate that day. At Bang Bang they had Korean donuts filled with icecream and sauce. I accidentally ordered the plain chocolate one and then had to get the icecream on the side. 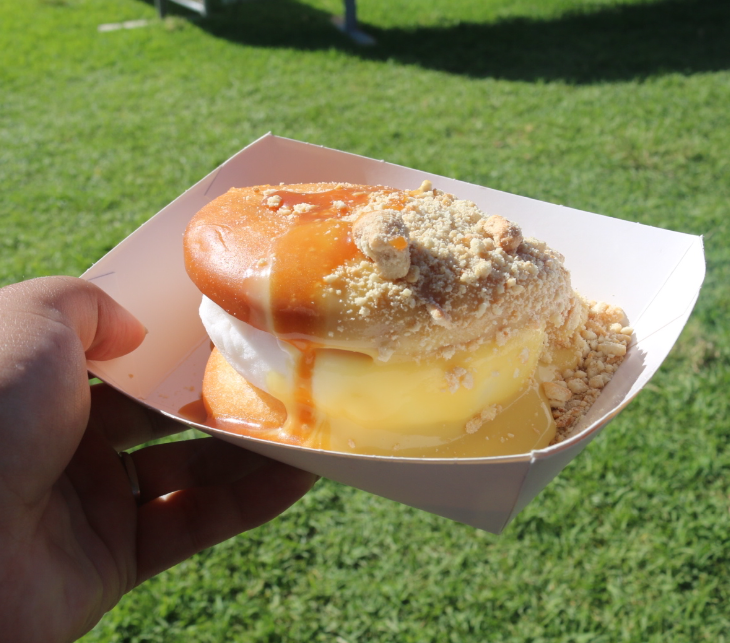 I tried to eat icecream and donut in the same mouthful to emulate the icecream sandwichness. I guess it was kind of the same. Not really. 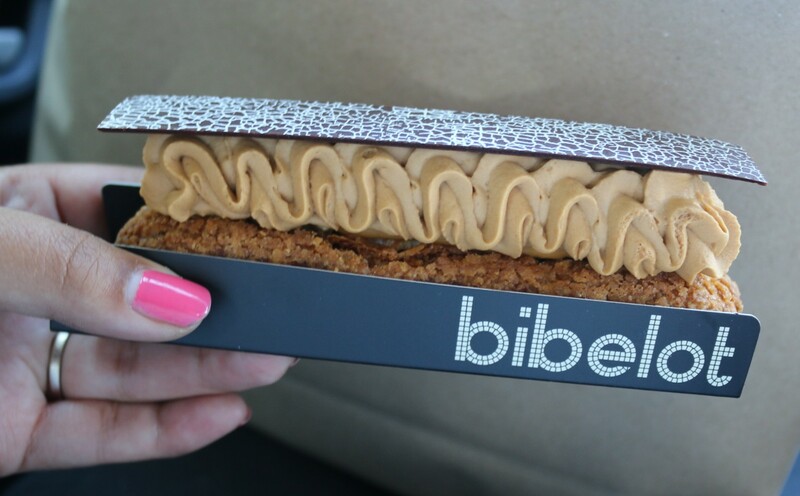 At Bibelot they had a range of their chocolates that you could try and buy. We got the salted butter caramel eclair, which was super indulgent, the caramel butter cream was divine. At the Luxbite stall they had macarons, mini cakes and tarts. 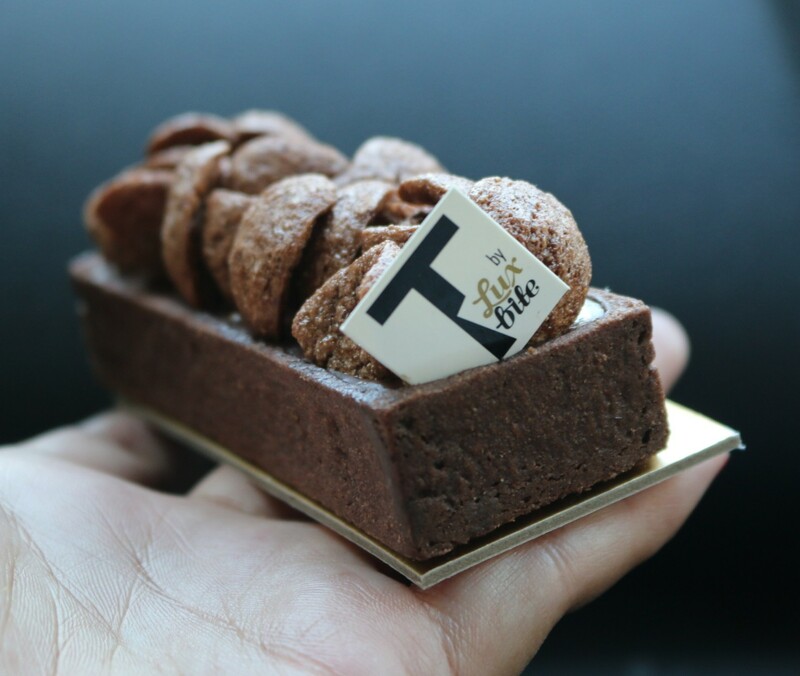 We had the Milo tart and it was delish. It had a chocolate tart base, filled with a milo choc filling with milo crisps sitting on top. It was super chocolaty and tasted like milo. Yum. Also they had some really cute Christmas gifts too. They had morning sessions from 9am -1pm and afternoon sessions starting from 2pm-6pm. We went on the Saturday to the afternoon session. There were heaps of great stalls and so many delicious sweets. I must say though it was super dark inside so hopefully next year they get a bit more light into the venue. But overall it was a sweet success. I was majorly sugar crashing later that evening. 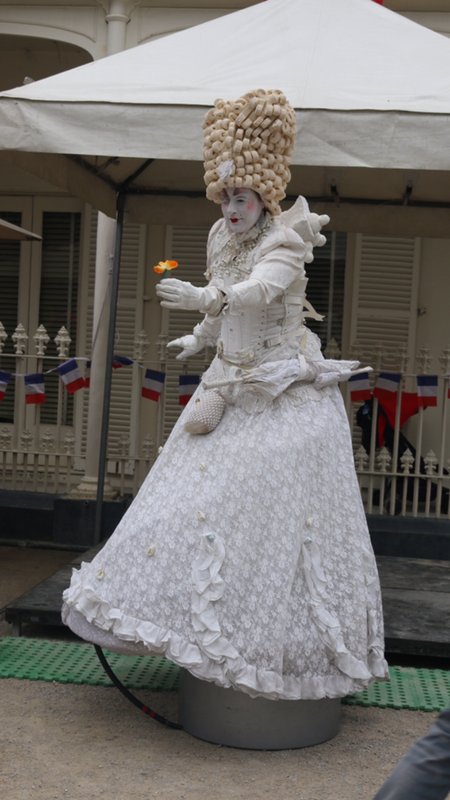 Paris to Provence is a French festival with stalls and activities that embrace the culture of France. 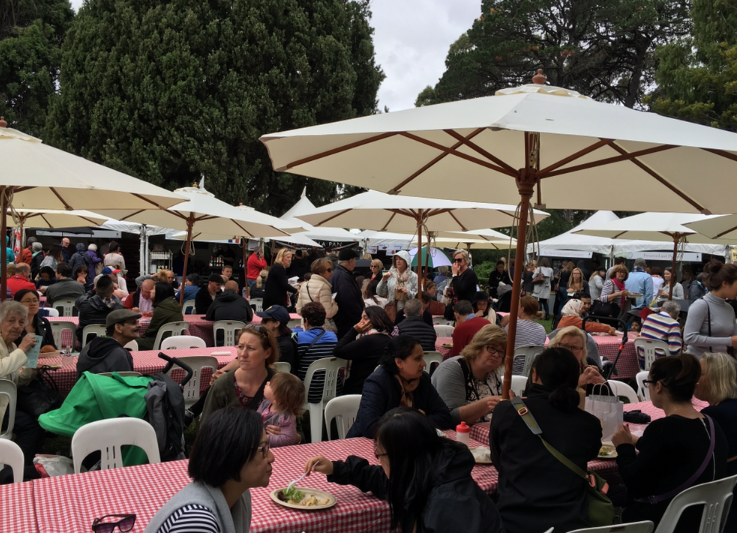 Held at the Como house and garden, the space is transformed into a little French village with entertainment and loads of amazing French food. There are artisan cheeses and meats and wine and pastries and chocolates. A fine selection of food and drink indeed. 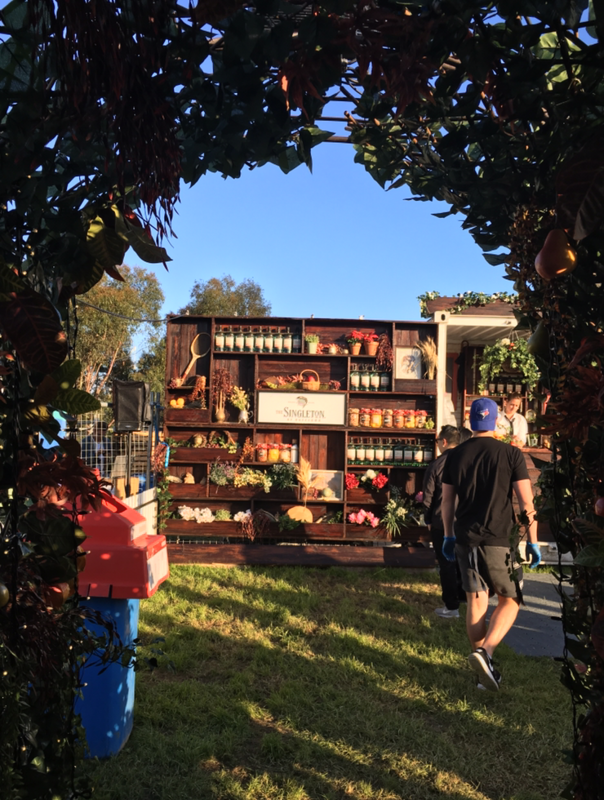 The garden is full of stalls and there are lots of areas to sit and enjoy the atmosphere. First up a chouquette, which is a little choux puff w sugar on the outside. It was super light and fluffy with soft sweet pearls of suger on top. Delish. 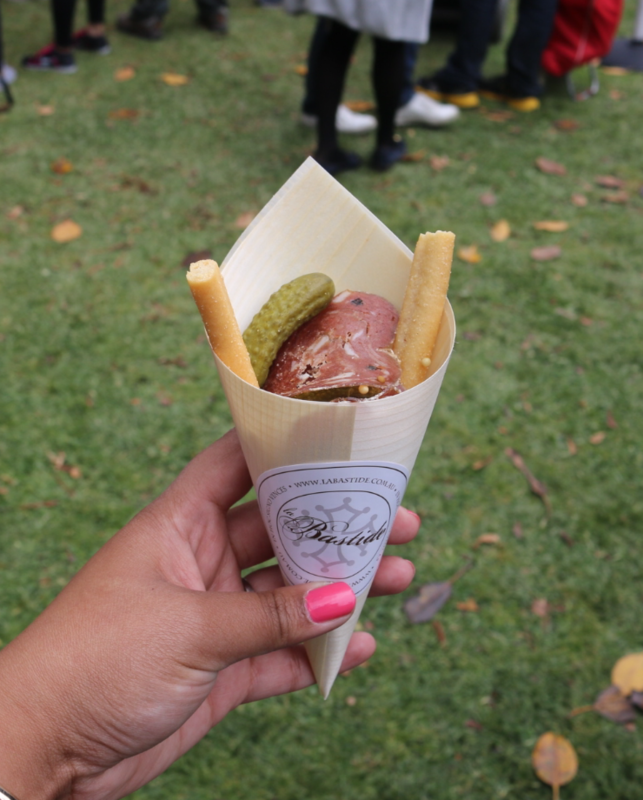 The La Bastide stall had these charcuterie cones with cold meats, pickles and bread sticks. It was a good walk around snack. They also had some delicious chicken pate, and fois gras baguettes. I tried a goats cheese tart from La Parisienne Pates and it was amazing. 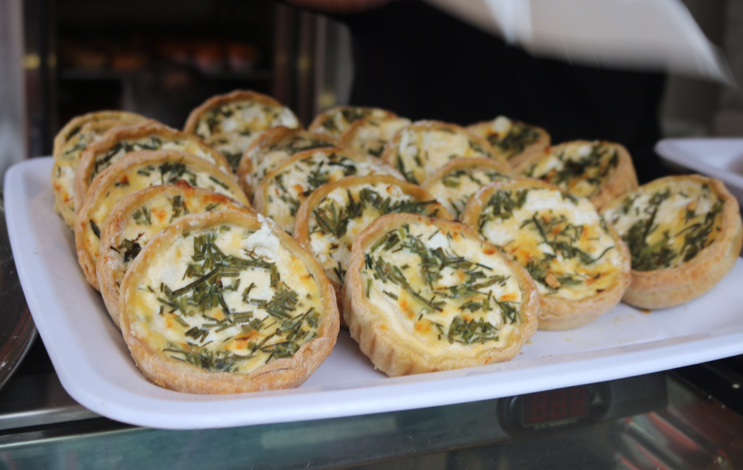 The pastry was buttery and short and the goats cheese filling with chives on top was really tasty. They also had quiche lorraine my fave. 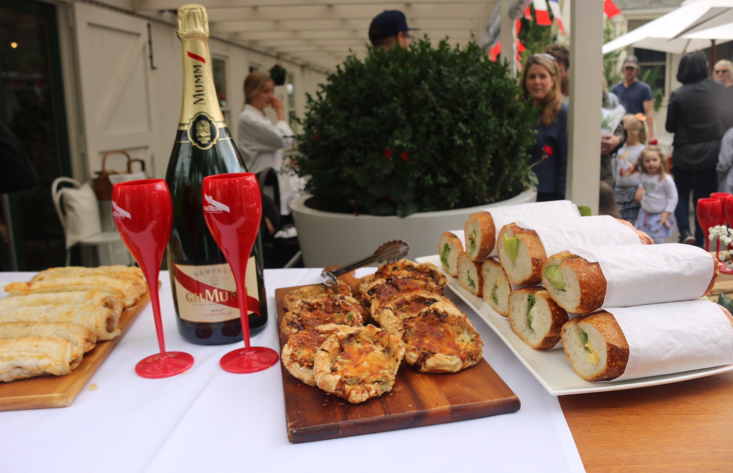 They had a range of savoury pastries and pies including duck pies and rabbit pies and beef burgundy. It was good because you could buy them hot to eat now or cold to bake at home later. They also had a large range of pate on offer. 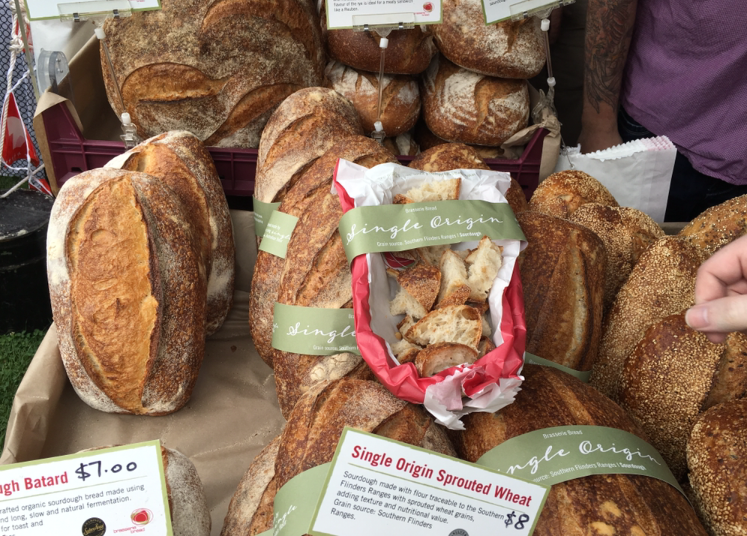 The Brasserie Bread stall was a bread lovers dream. The bread looked and tasted incredible. 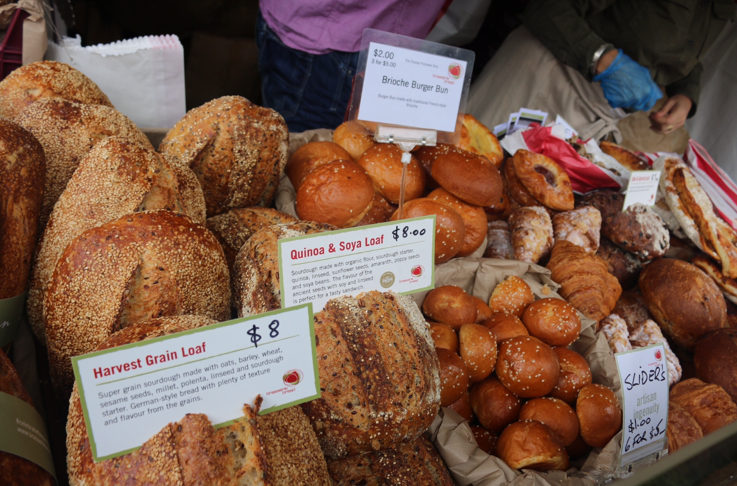 They had a range of breads, crusty sourdough, quinoa and soy, French sticks, brioche, mini brioche slider buns. It was fantastic. We took home a loaf of the garlic bread, which was amazing. It had roasted garlic swirled through and sweet roasted garlic cloves scattered throughout. Loved it. 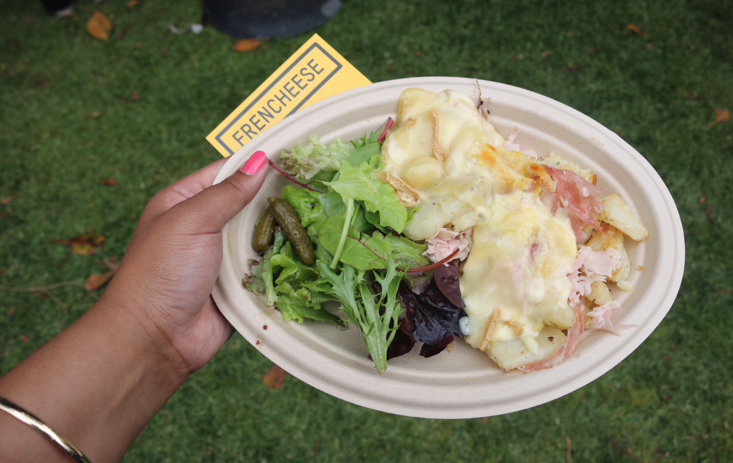 At Frencheese they were serving raclette. It’s a semi-firm cows milk cheese that is good for melting. The way it is served is a plate of fried herbed potatoes are layered with cold meats and then the raclette is melted like fondue and poured over the top, served with gerkins and salad. It was delicious. Hot, oozy cheese ohh yea. A lady was telling me about how she used to go to raclette parties all the time in France. It sounded awesome and I’m thinking I need a big wheel of raclette for my next bbq. Then onto the croissants. 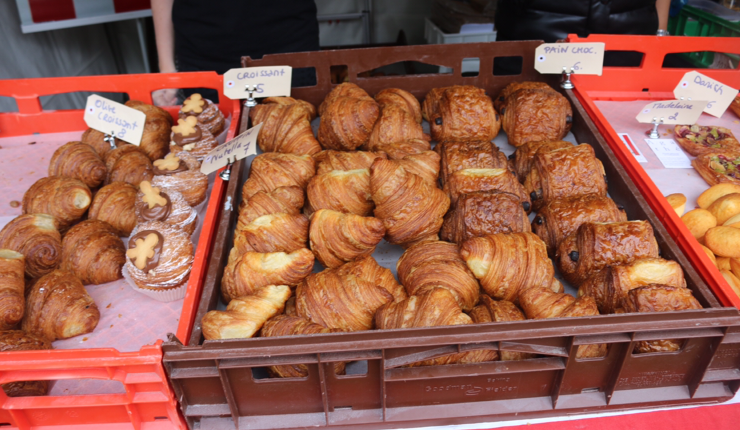 What is a French festival without a few cheeky croissants. Agathe Pastisseie had some traditional croissants like the plain and pain au chocolate. 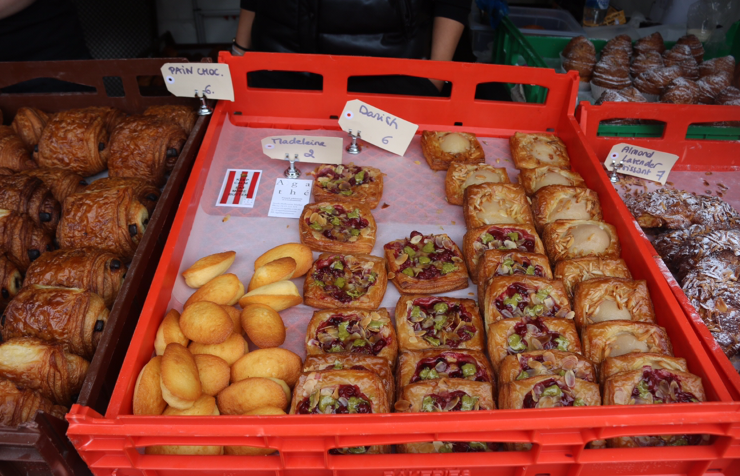 They also had pear and almond danishes and cheery pistachio ones. All amazing. The danishes were buttery and crisp on the outside with awesome flavour combos and the croissants were airy with lots of buttery layers. Mosaic Pastiserrie had a range croissants aswell including almond croissants and a range of croissant muffins. They also had shelves of colourful macarons on offer. 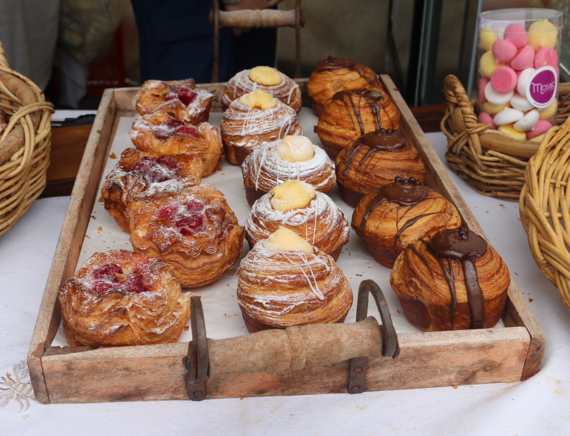 A la folie had a range of thier sweet pastries including the petite choux, which are little choux puffs filled and topped with different flavours. They also had their raspberry vanilla filled macarons and the vanilla mille fueille. So so good. 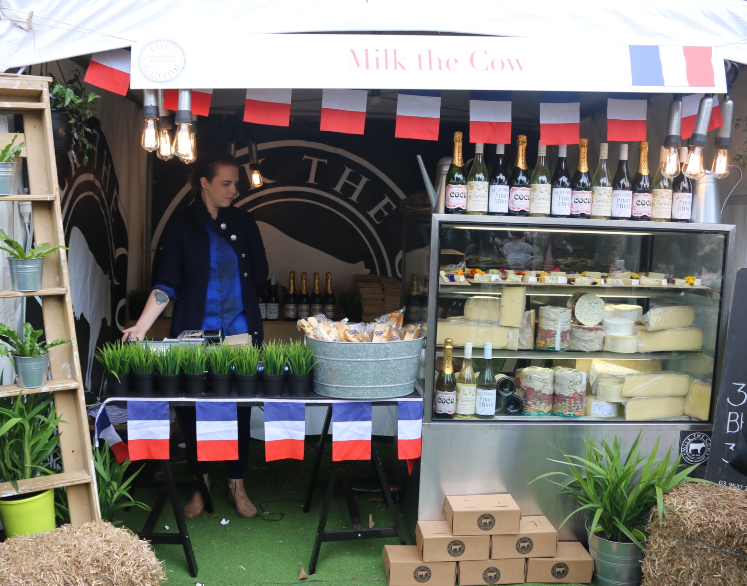 Milk the cow had a stall with a selection of artisan cheese and wines. 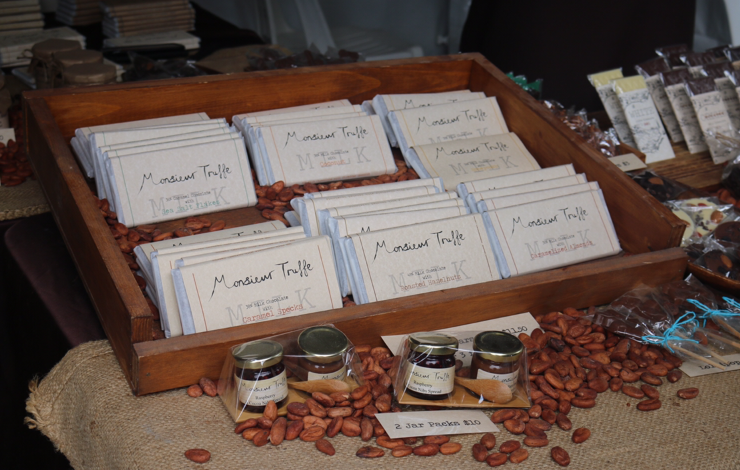 Monsieur truffle had a stall with a selection of their artisan chocolates. 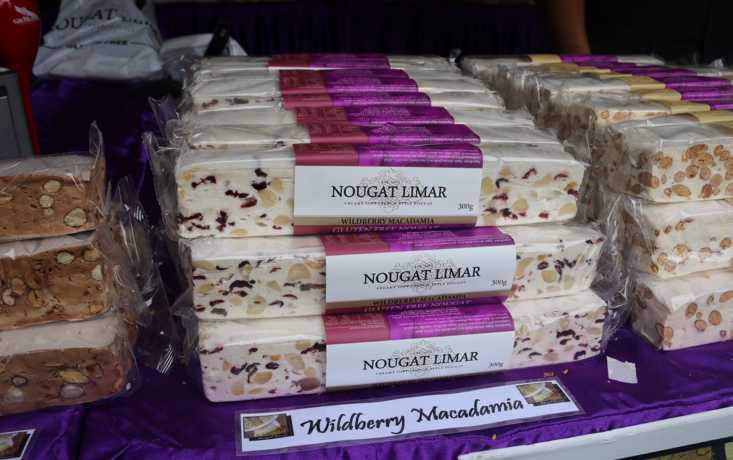 Nougat Limar had a stall serving a variety of delcious nougat, which was soft and creamy. There was vanilla and almond, pistachio and cherry cranberry, and chocolate almond hazelnut just to name a few. The doughnuts balls were nice, fresh out of the deep fryer. 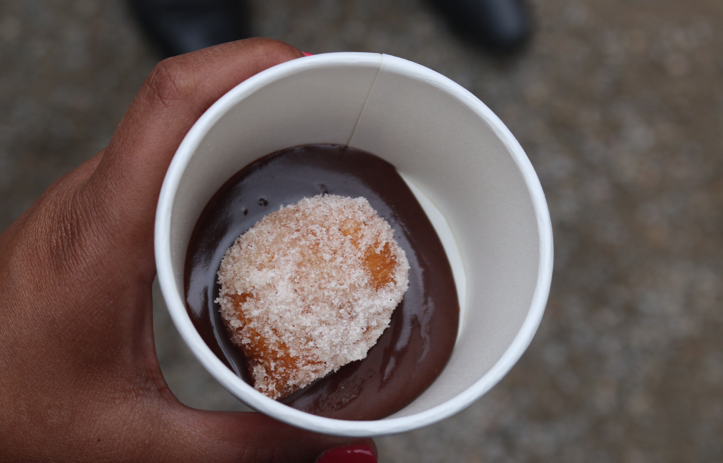 They were soft and fluffy and covered in sugar, sitting in a pool of nutella or salted caramel. 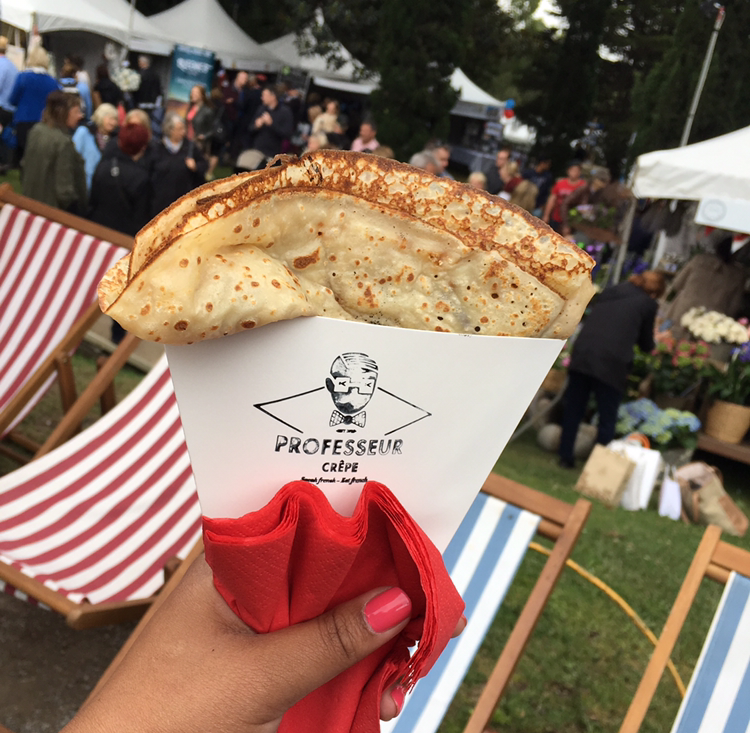 The crepe we got from Professeur crepe was perfect. It was thin, soft and fluffy, with a good amount of nutella. They had a range of flavours savoury and sweet. Yumness! There was lots of entertainment for all ages there were roving mimes, magicians, musicians. There are also adult art classes, chef demos, a bean bag area and a secret garden area with childrens activities. 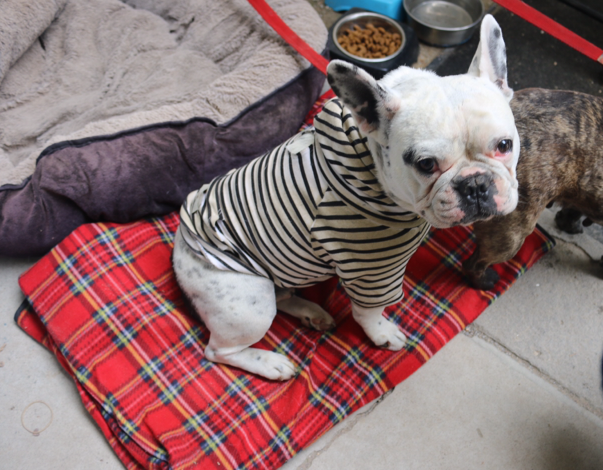 We got to meet the lovely Jinkee from @lifeofjinkee, who was judging the French bulldog dress up comp. 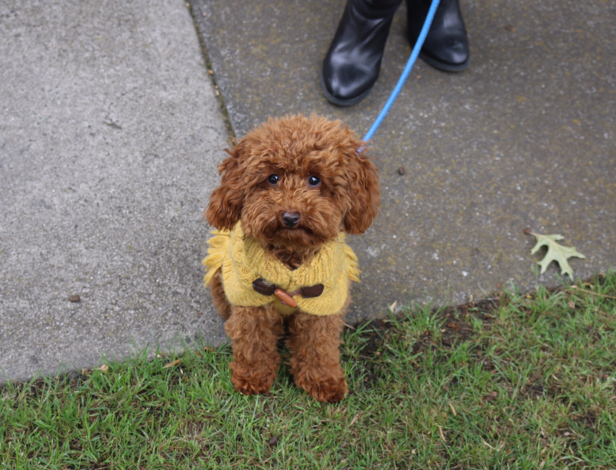 She was so gorgeous, just the most adorable puppy ever. These were some of the entrants. So adorable, the king and queen. 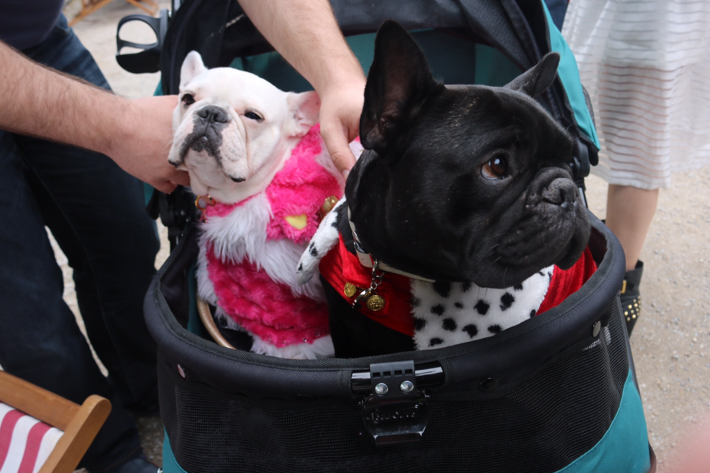 There were French bulldogs everywhere, i had never seen so many in one place. 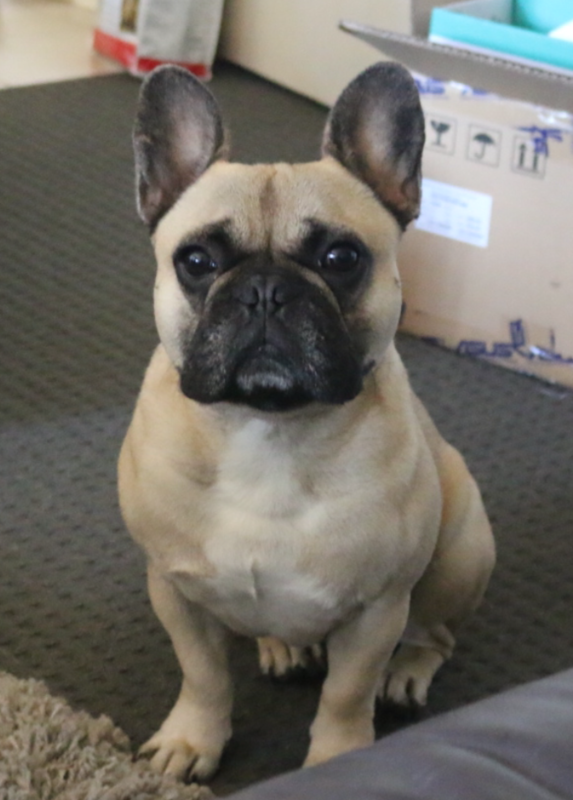 We felt sad that we didn’t end up bringing our Frenchie Max. This was his face when we got home. After a whole lot of sniffing Max identified that we went to the French festival without out him. He was not impressed. They played the French national anthem for solidarity in light of recent events which was nice. It was a great event and a great opportunity to indulge in all things France, even just for a weekend. Today is the last day of the event so head down if you can. The venue is covered in French flags, you can’t miss it. I heart Paris to Provence! 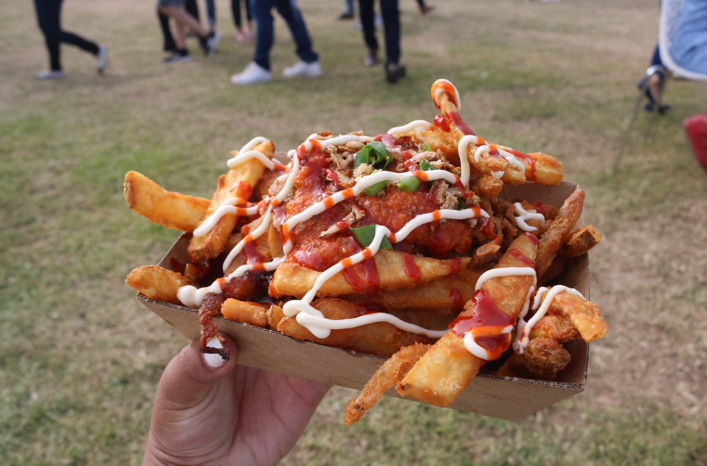 This year at the night noodle markets there are some new stalls and some oldies. I have literally been everyday this weekend because there is so much amazing food in the one place and so why not. I couldn’t possibly have eaten everything in one day but I certainly wanted to. I dragged people out on Friday after work, went with my family on the Saturday and pulled some friends together for a Sunday session. Each time was as drool worthy as the last. So much deliciousness in one spot. 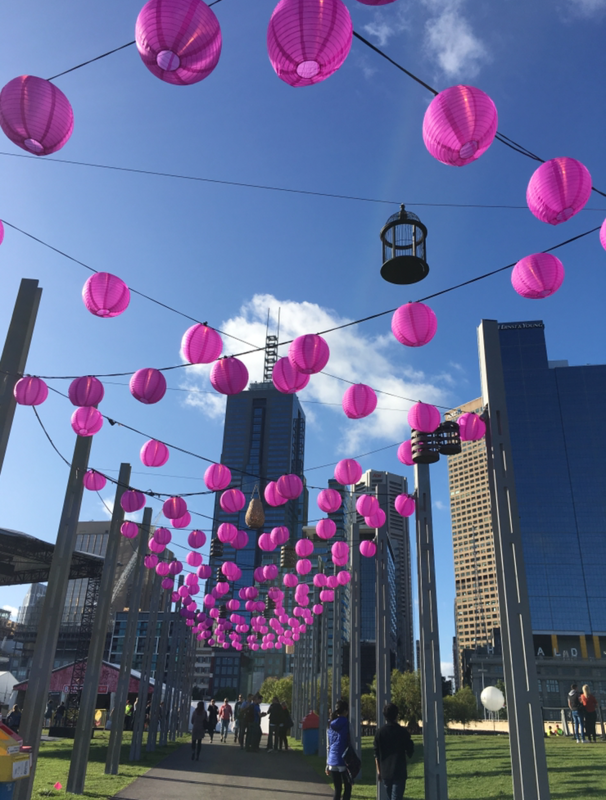 The pretty lanterns. Purple this year. These skewers are great to start with. 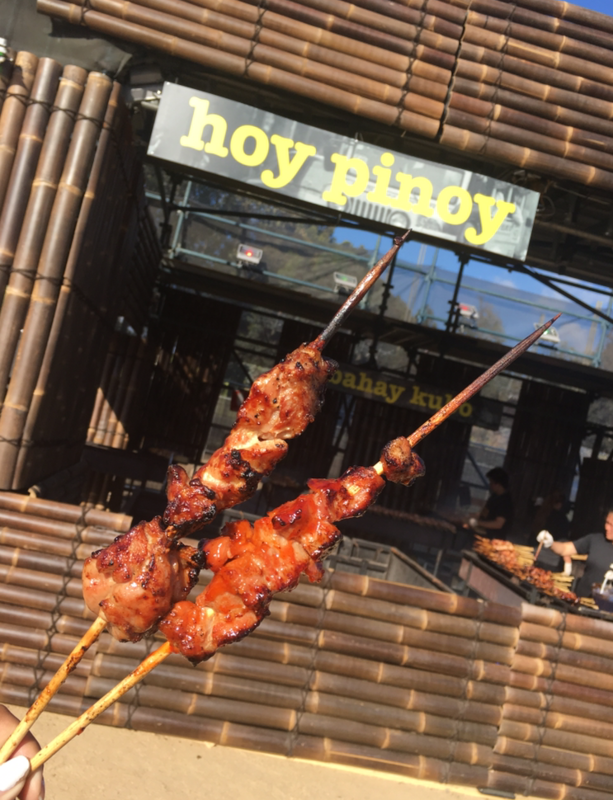 Hoy Pinoy serve Phillipino BBQ and they do it well. They have a big charcoal bbq area where they cook bbq chicken and pork belly skewers and whole roasted pig (lechon). The pork belly skewers with banana ketchup are my fave. They are juicy and have that charcoal flavour, marinated in a sweet sauce. Delish. 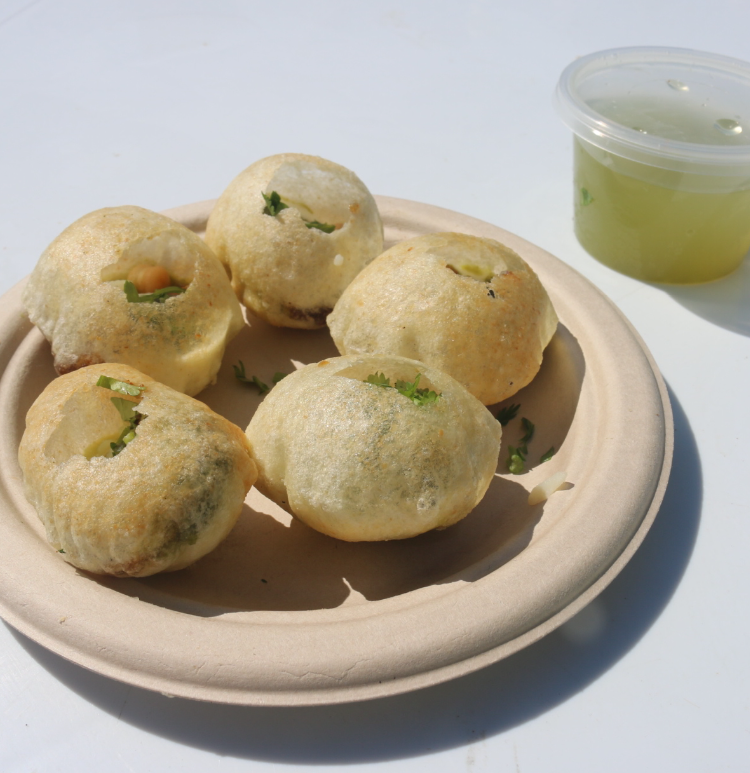 Delhi streets had their pani puri on the menu, which is one of my fave dishes from their restaurant. They are little lentil crispy puffs filled with chickpeas, tamarind chutney, yoghurt and herbs and spices. The way to eat them is to pour the spiced water half way and then eat the puff in one mouthful. It’s spicy and sour and crunchy and soft and fresh all at the same time. They are amazing. Red Spice Road do an awesome pork belly. 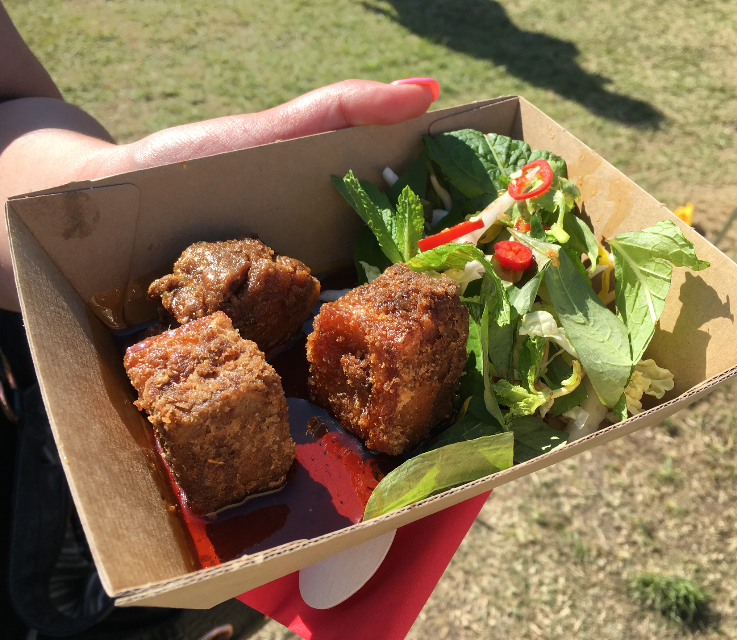 Squares of crispy five spice pork belly with sweet and sticky chilli caramel. It’s served with a fresh asian slaw. Delish. At Charlie Dumpling we had the chicken and goji dumplings w spiced black vinegar caramel. They were tasty, the skin was thin and soft and the filling had lots of flavour. They were nice. 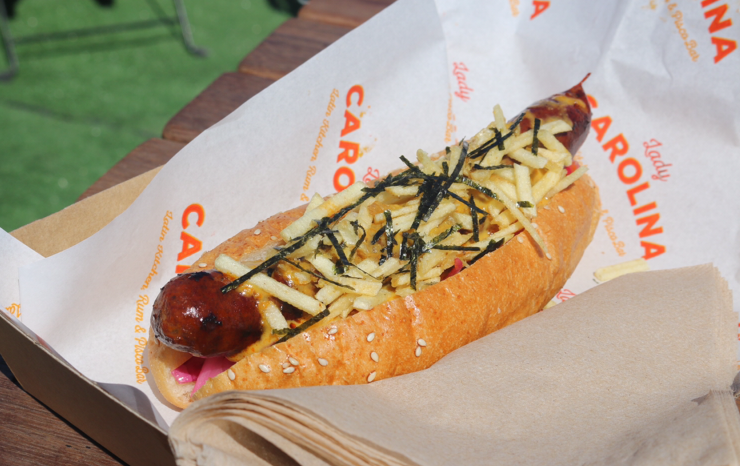 Lady Carolina is one of the new comers and they had a Nikkei dog, which is like a hot dog with a Japanese twist. It was tasty, the Wood BBQ Huachana sausage was spicy and the bread was soft. It was topped with nori, French fries for crunch and Amarillo salsa (like a chilli sauce). It was yum. 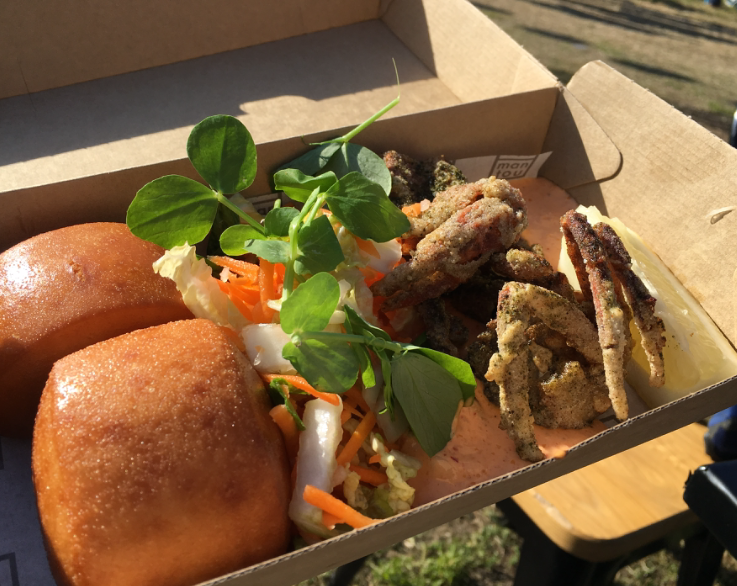 We had the soft-shell crab from Mantou which was five spice battered soft-shell crab with sriracha mayo and deep-fried mantou. Mantou is a small sweet bun that is soft and fluffy and crispy on the outside. It is generally used to soak up all the juices of the meal. 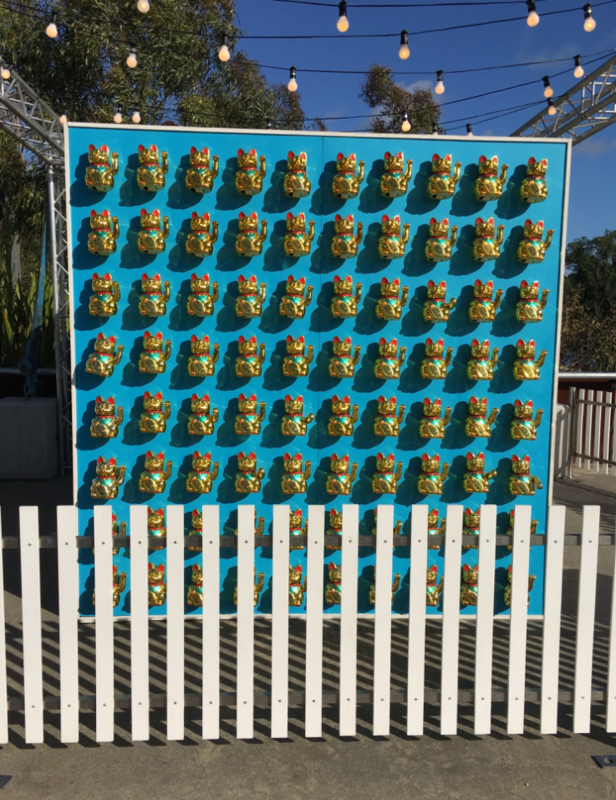 A whole wall of the Chinese lucky cats. At wonderbao we had the fried bao filled with three types of mushroom, tofu and vegies. 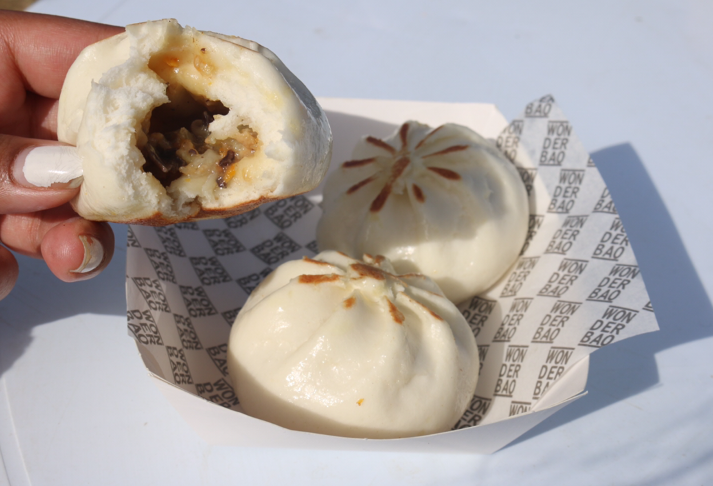 It was tasty, they make delicious baos that are soft and fluffy. A good vegetarian option. Yum. 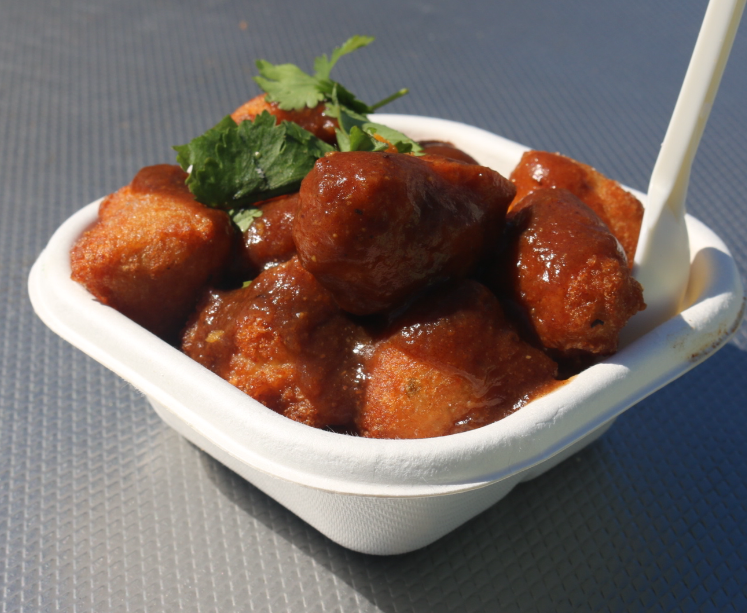 Another veg/vegan GF option is the lentil poppers from Overdosa. They are little bite-sized balls made of lentils and fried. It comes with a lovely tamarind and date chutney. They also make dosa of coursa. 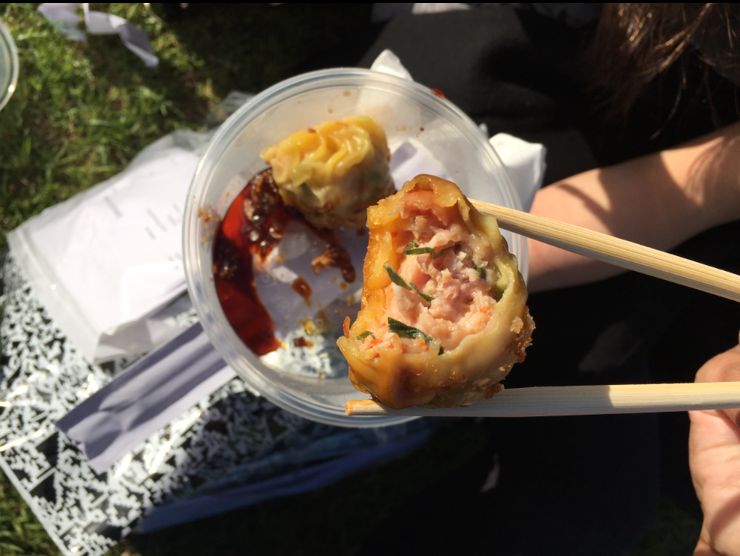 We tried the pumpkin and ginger noodle balls at Chilli Tuckshop and they were delicious. They had deep-fried crispy noodle on the outside and soft cooked noodle in the middle. They were flavoursome and pumpkin and ginger is a great combo. They had a bottle of green sriracha sauce that I hadn’t tried before. It was hot and had a sourness to it. It went perfectly with the noodle balls. Delish. At Poklol we had the chichi fries which was crunchy potato fries with spicy pork bulgogi, kimchi and kewpie mayo. It was tasty but definitely a dish to share, it was quite filling. Hawker hall stands beside its renowned sister counterparts Chin Chin and Kong as a new addition to the Ben Cooper area. They serve a Malaysian beef rending which is a signature dish at the newly opened restaurant. And it is extraordinary. The flavours are intense, in your face and complex, absolutely sensational. The meat is slow cooked and falling apart and it’s topped with toasted coconut, which adds freshness and texture and all of that delciousness is sitting on a bed of fluffy rice. 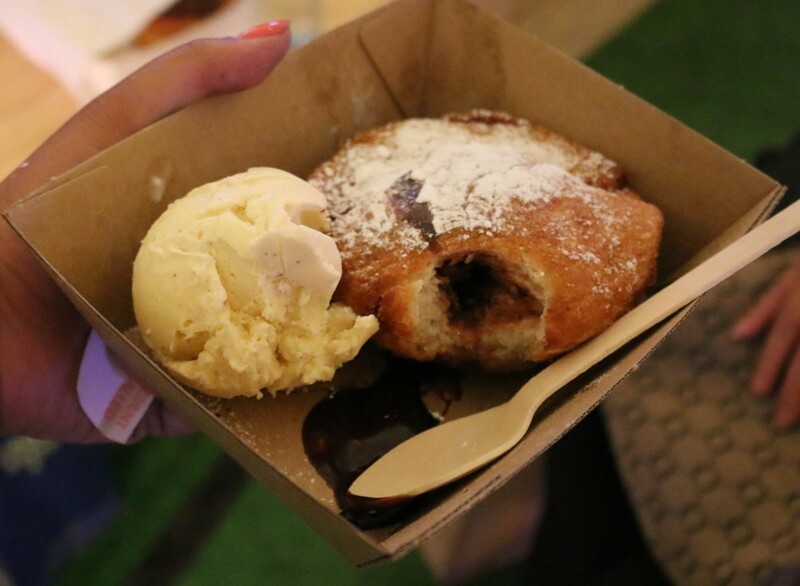 Definitely one of my faves at the night noodle markets this year. 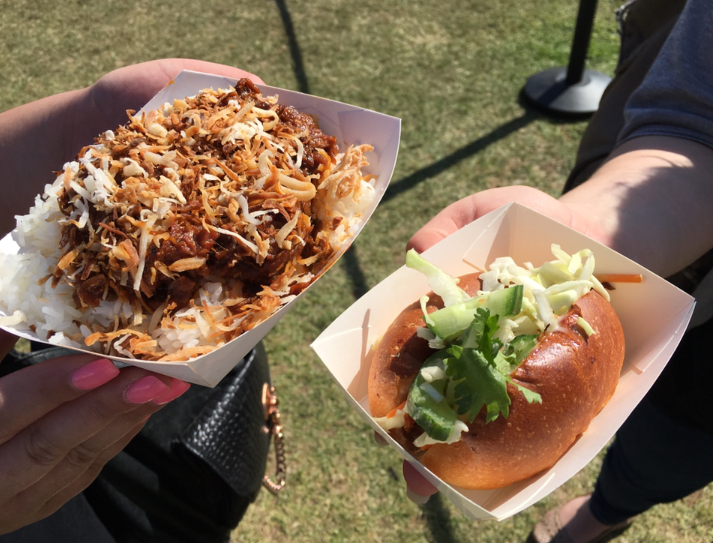 The Chin Chin pulled pork slider has been around since the dawn of night noodle markets and it’s delicious. It’s a little bun filled with pulled pork, slaw, pickled cucumber and sriracha mayo. It has the perfect balance of flavour and freshness and is a good little snack. 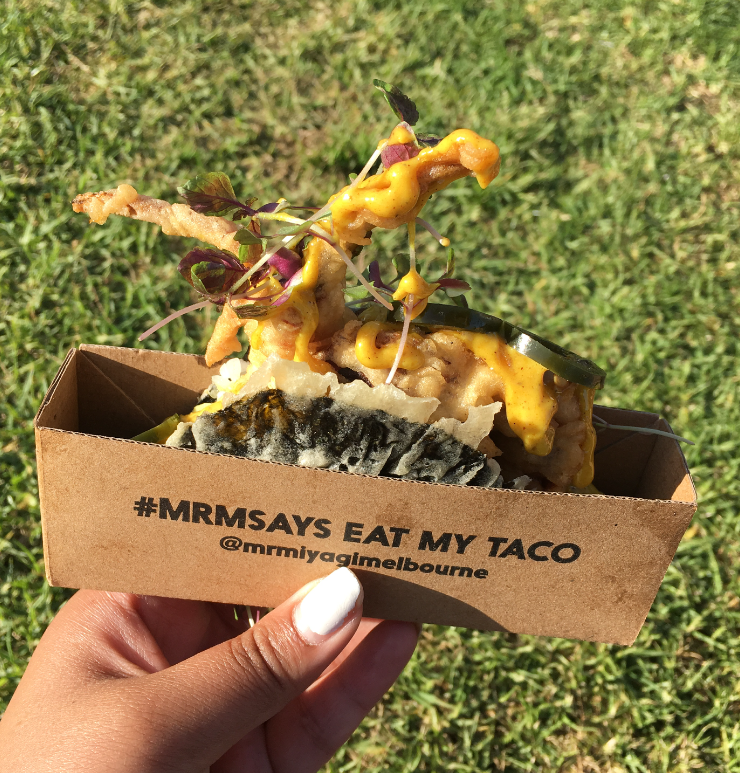 Mr. Miyagi has a range of nori tacos available as well as their popular MFC (miyagi fried chicken). 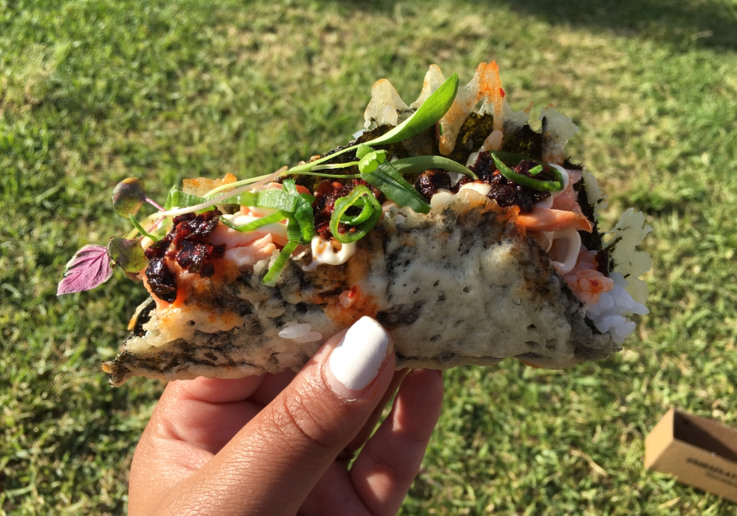 We had the soft-shell crab nori taco, which had a light tempura batter and a zingy curried mayo sauce with crispy garlic on top of sushi rice in a nori shell. The nori taco shell holds together really well. It is covered in tempura batter and fried and doesn’t break and fall to pieces when you bite it. We also had the grilled salmon one, which had chunks of beautifully grilled salmon with kim chi, Japanese mayo and chilli oil on sushi rice. Super delicious. The entrance to the whisky bar was whimsical and had a nice set-up. 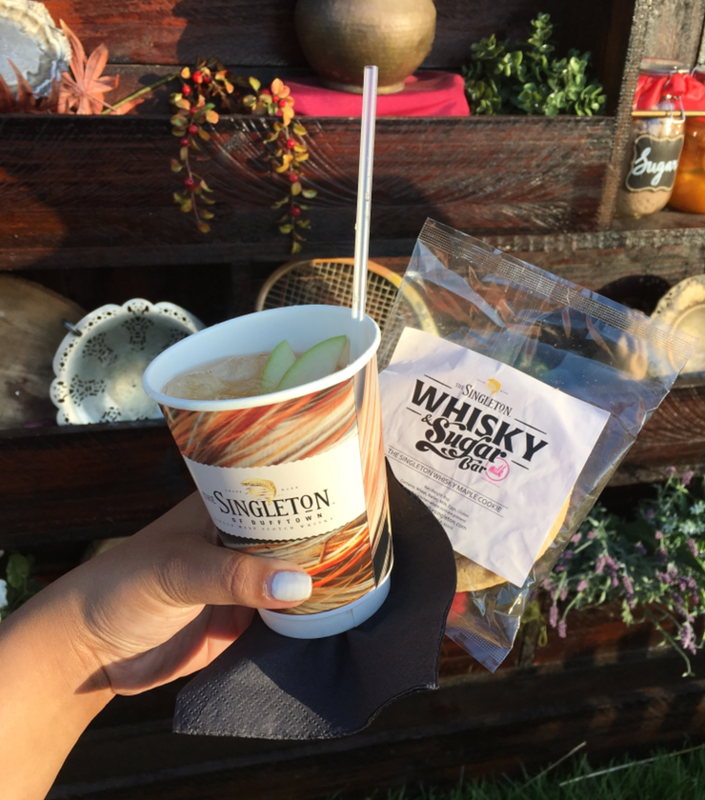 They were serving Singleton maple whisky, which I hadn’t tried before, it was sweet and it came with a yummy momofuku maple cookie. Winning! 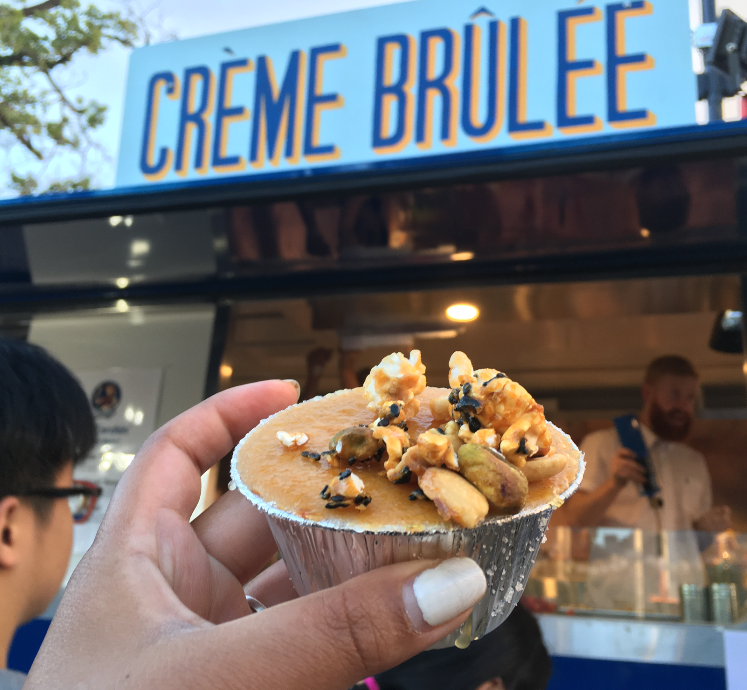 From the brulee cart we had the salted caramel and ginger crème brulee with sesame caramel popcorn and pistachios on top. The custard was thick and eggy and it had a crispy bruleed top. The Sugar Prawn x Luxbite creation was great. 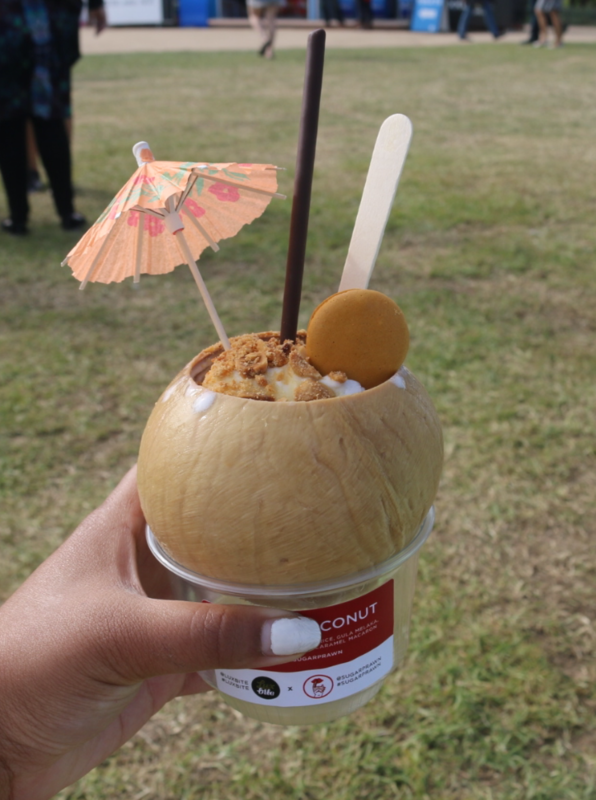 Firstly it was served in an actual coconut, wow. Then there was a refreshing coconut & lime sorbet sitting on top of sticky rice and caramel. It had peanuts on top, a chocolate covered pocky stick and a mini Luxbite salted caramel macaron. It was full of surprises and fun to eat. At Harajuku Gyoza they had fried gyoza filled with banana and nutella. They were yummy little sweet dumplings served with vanilla icecream. 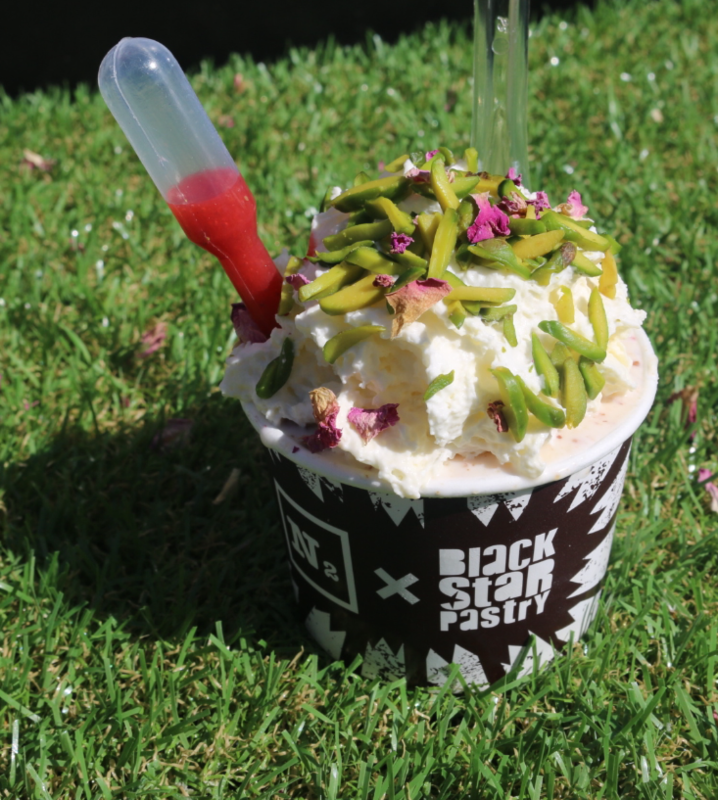 Every year Gelato Messina come up with new creations for the night noodle markets. 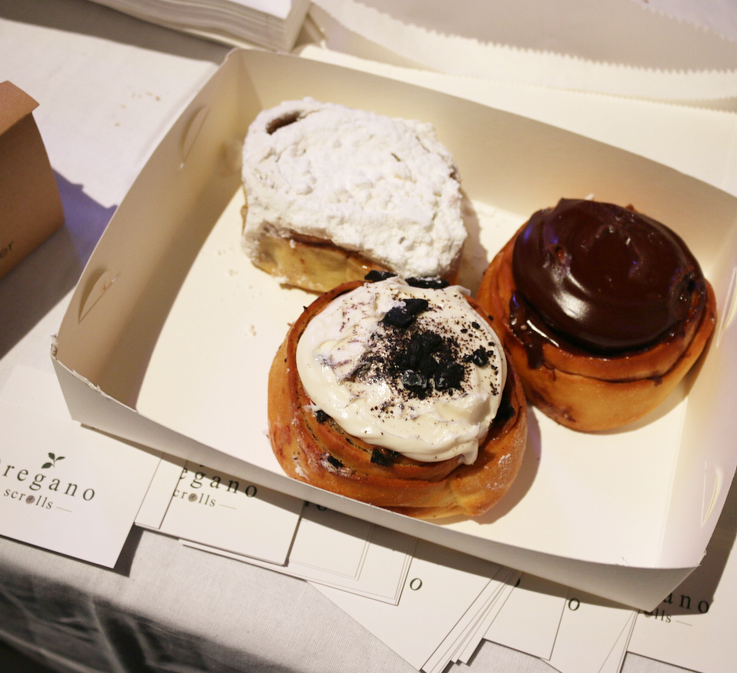 This year they had fried gua baos, which were almost like fried doughnuts with the fluffy bao centre filled with gelato, dipped in chocolate. I love the names they come up with too. 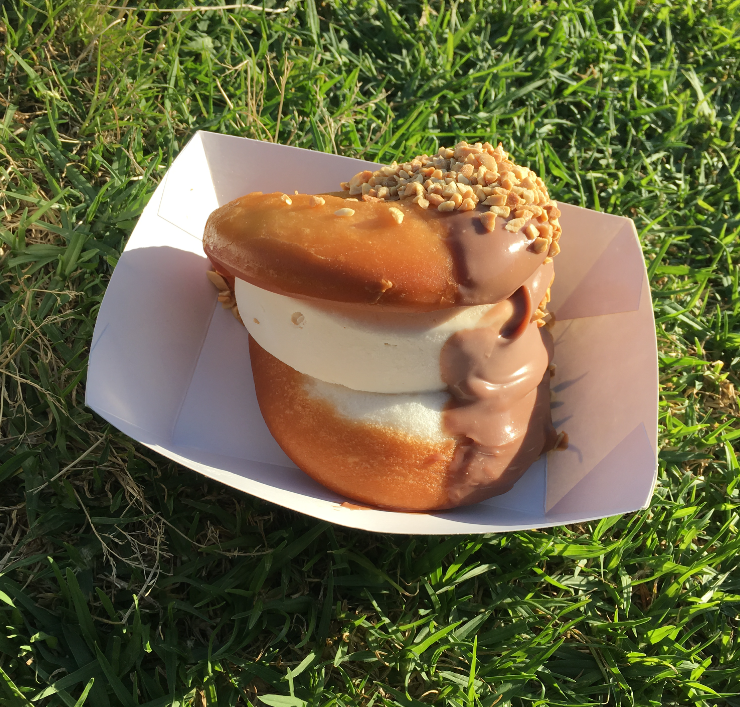 This was the bao chikka bao bao, which was a deep fried gua bao filled with peanut gelato, dipped in milk chocolate sauce and rolled in crushed peanuts. 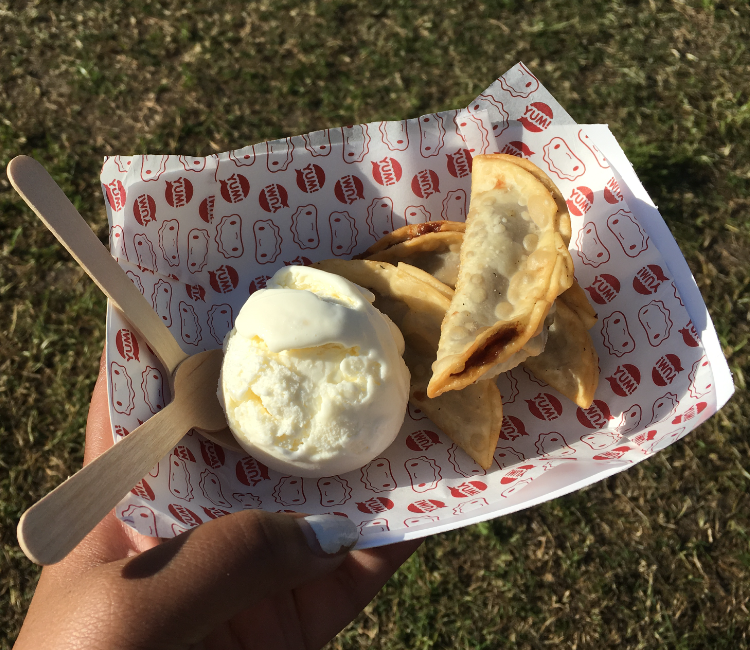 We also tried the David Bao-wy, which was a deep fried gua bao filled with salted coconut sorbet, dipped in white chocolate mango ganache and rolled in crushed cashews. Delish. 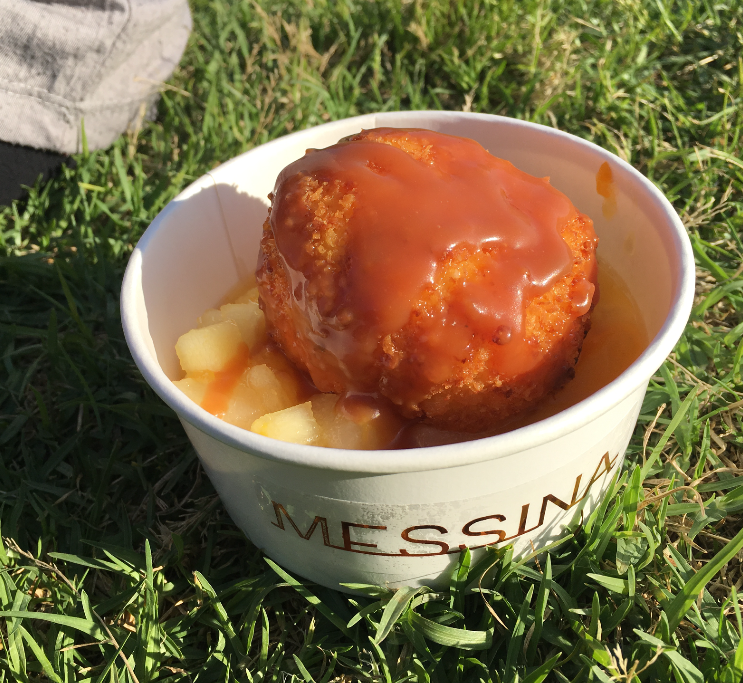 The deep fried ice cream balls were filled with thai custard gelato and were sitting in ‘messina tinned fruit salad.’ There was chocolate and salted caramel sauce to put on top. 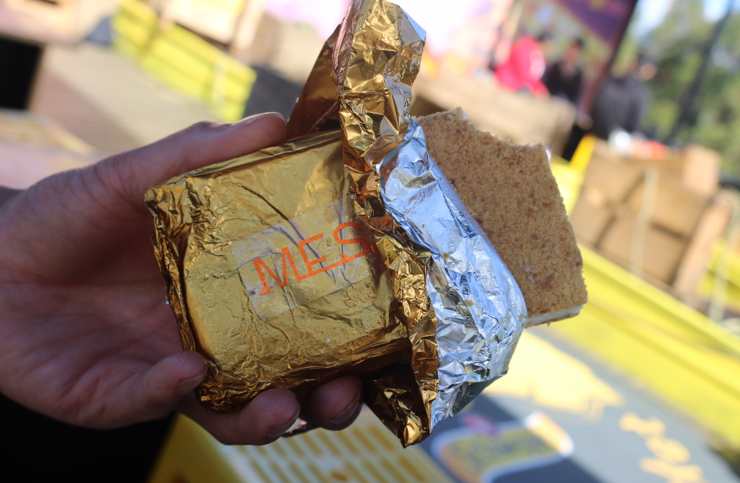 They also had a gold bullion bar, which was layers of gulamalaka gelato, condensed milk gelato, passion fruit jelly, a nut crunch, and banana bread. 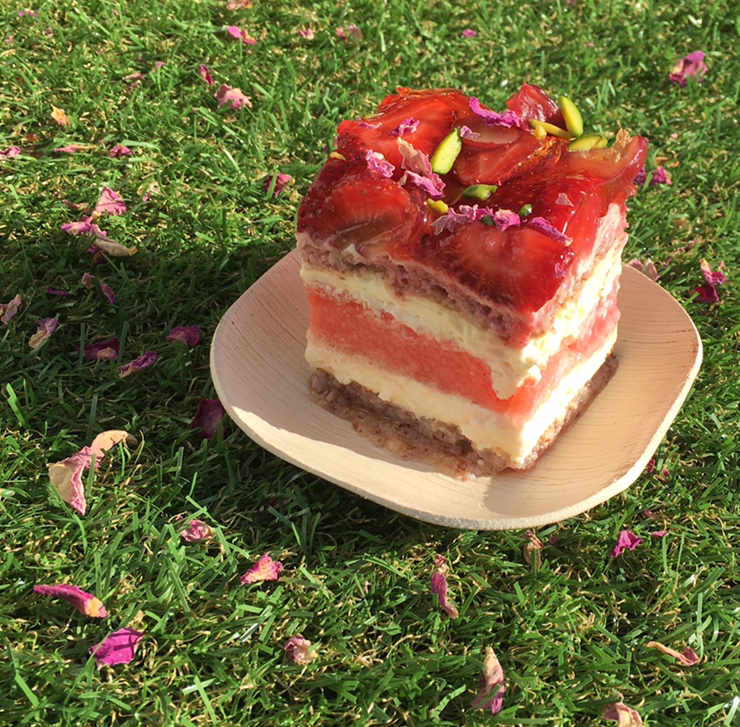 Black star pastry is from Sydney and when I heard they were bringing their famous strawberry and watermelon cake to the night noodle markets in Melbourne I was super excited. I had high expectations and it delivered. It was delicious. It had flavours of strawberry, watermelon, cream and rose. It was delicate and the fresh watermelon pieces were refreshing. It was a beautiful cake. So since I liked the cake so much I tried the cake smash too, which was a Black star pastry x N2 gelato creation. Basically it’s the strawberry and watermelon cake in a gelato version. It was delish. They have bars around the place to grab a beverage alcoholic or non. Although my mum really wanted a can of coca cola and there was none to be found. I’m happy that this festival goes for a couple of weeks because there is so many great food stalls. It’s a great space to hang out, bring the people you love and be surrounded by lots of amazing food. 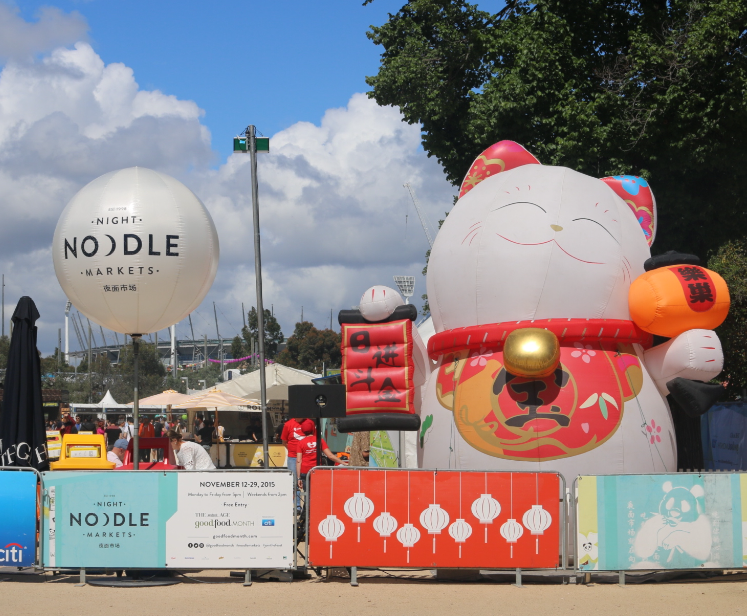 I heart the night noodle markets! 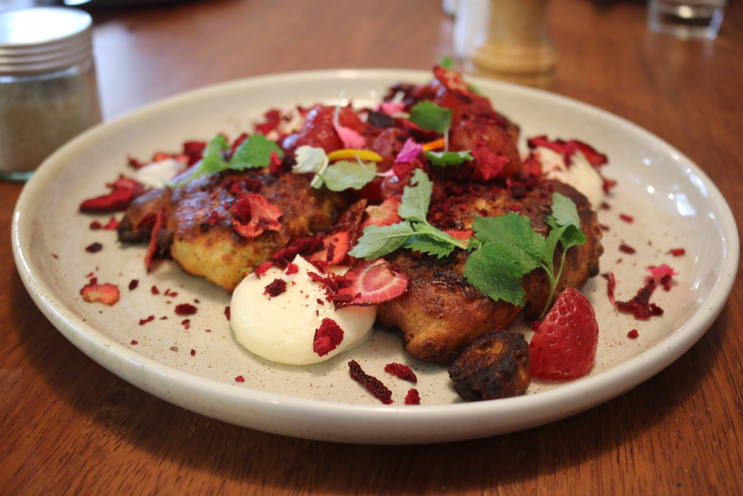 Bawa is a cafe that recently opened in Hawthorn and is very popular for good reason. The food is amazing and the atmosphere has a positive vibe. 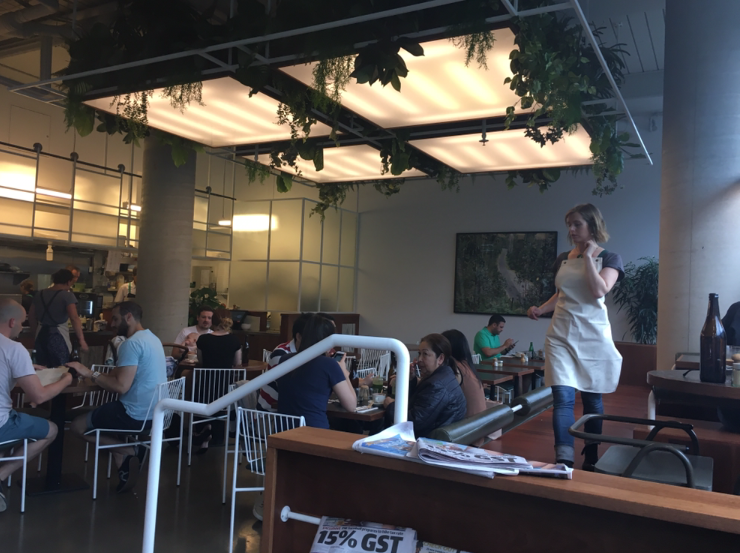 Both the menu and décor have a bit of a tropical theme that is expressed in a contemporary way. With their combined talents from pillar of salt, square & compass, barry, and three bags full, this interesting menu is set to inspire. The décor has an open space, nature-loving feel about it with lots of light and greenery. They do a really good coffee. 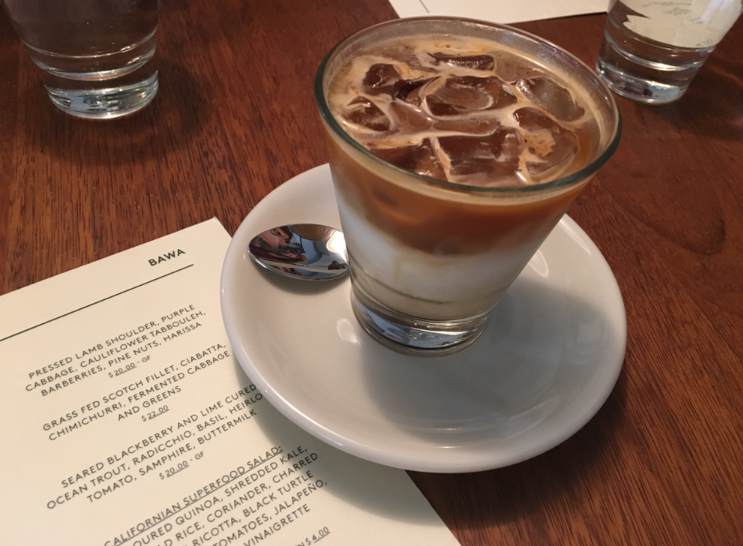 Iced latte included. I hadn’t heard of a black tonic before. It was awesome. 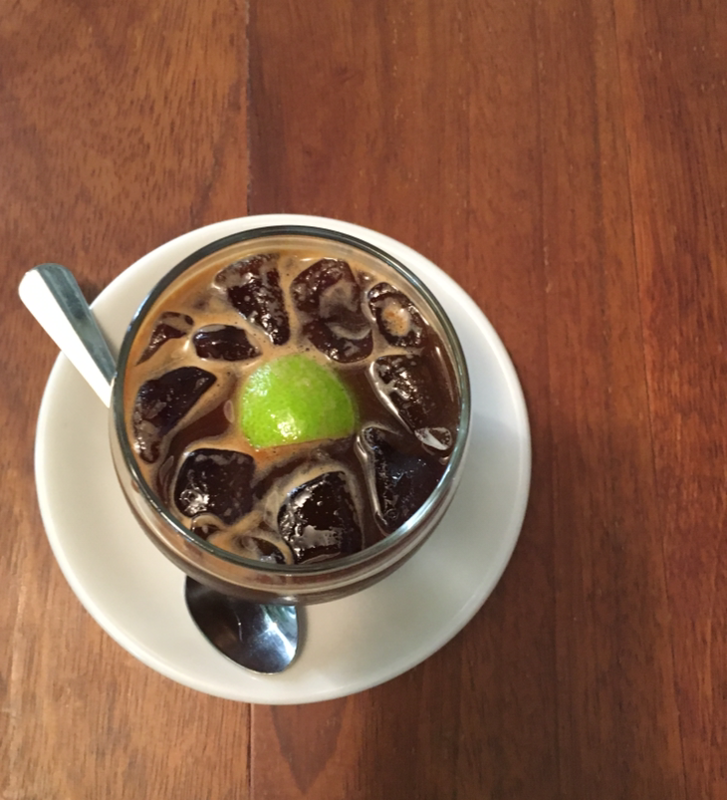 An espresso with lime and tonic. So refreshing. One mouthful of the chia pudding instantly took me to clear blue seas and white sandy beaches some place of a tropical island. 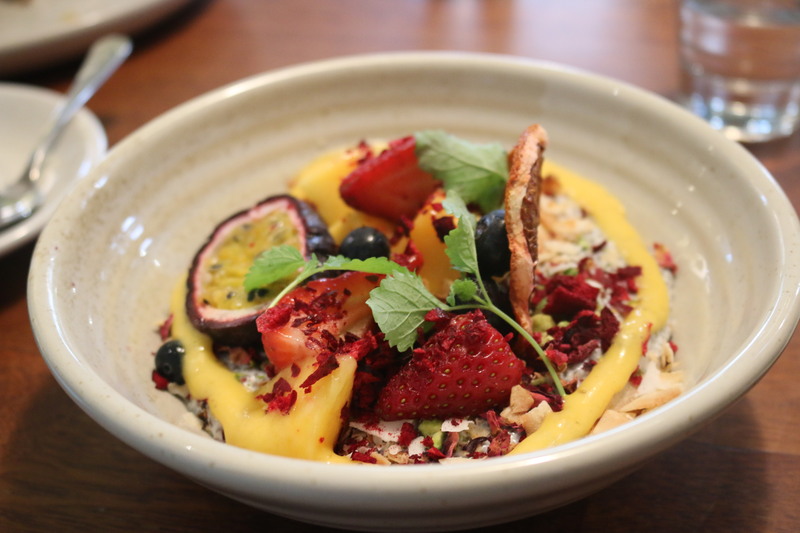 The chia pudding was creamy with coconut and had chunks of tropical fruits like passionfruit, mango and an assortment of berries. There were also a variety of dehydrated fruits and pistachios with a touch of rosewater and some fresh mint. It was paradise in a bowl. 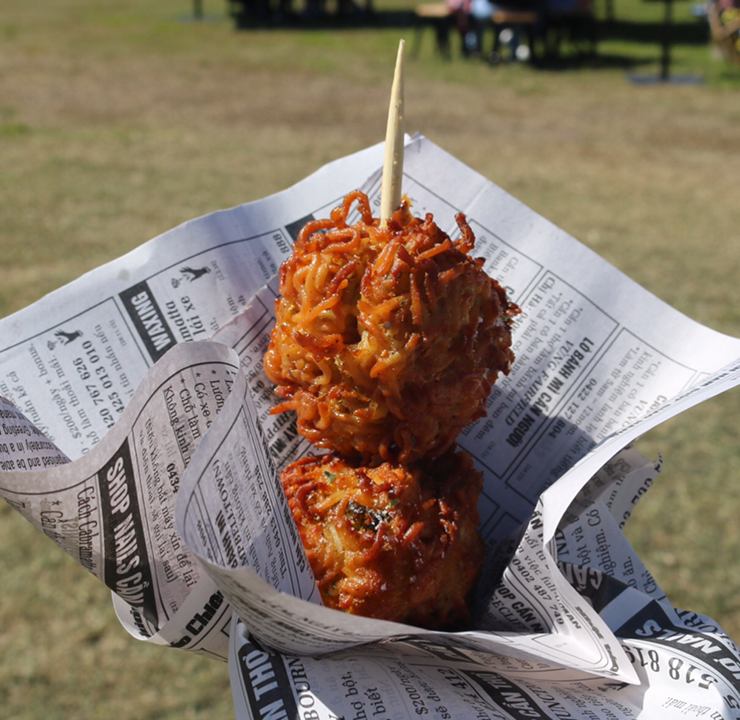 The potato rosti was exactly the way a potato rosti should be. Golden and crunchy on the outside with soft grated potato in the middle. It was covered in a generous amount of juicy slow-braised pulled pork (amazing!) and perfectly cooked poachies. It was topped with a lovely sweet, creamy tangy hollandaise. It was herby and had flavours of apple. There were also cuts of dehydrated apple scattered around the plate that added an interesting texture. Delicious! The seared blackberry and lime cured ocean trout was cooked perfectly and had a beautifully crisp skin. 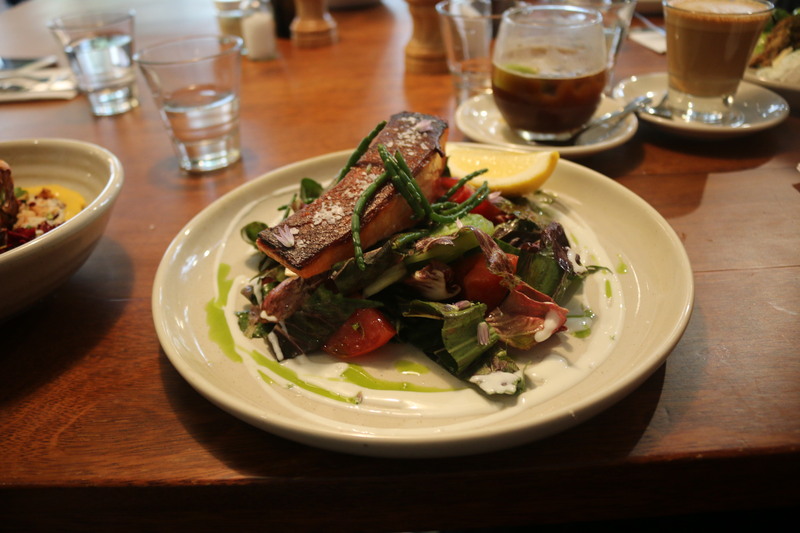 The oily fish melted in your mouth and had a lovely salad to accompany it with radicchio, heirloom tomato and samphire, which worked well with the ocean trout. It had a buttermilk dressing and a basil vinaigrette that brought it all together. 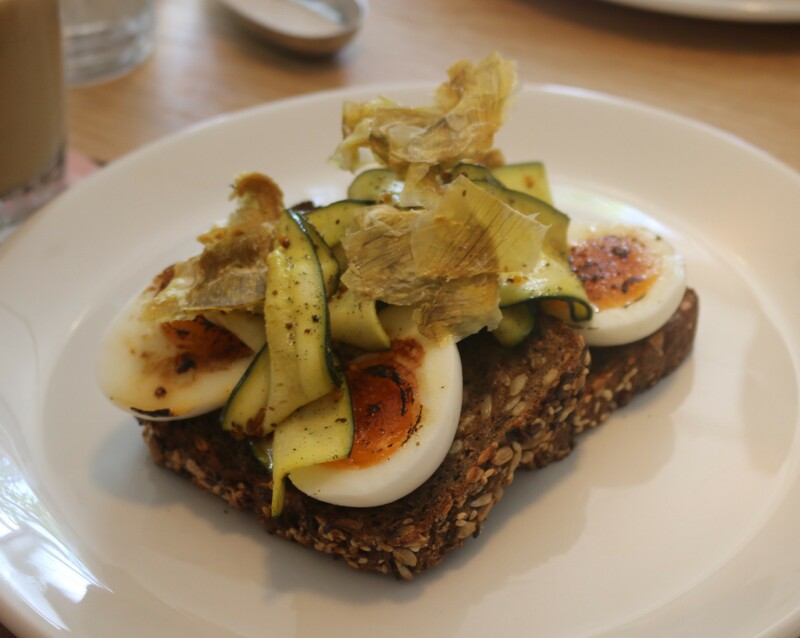 If you want to customize your meal, eggs your way on toast is a good way to get started. My friend got the eggs your way (she went with poached) and then tacked on all of her faves. 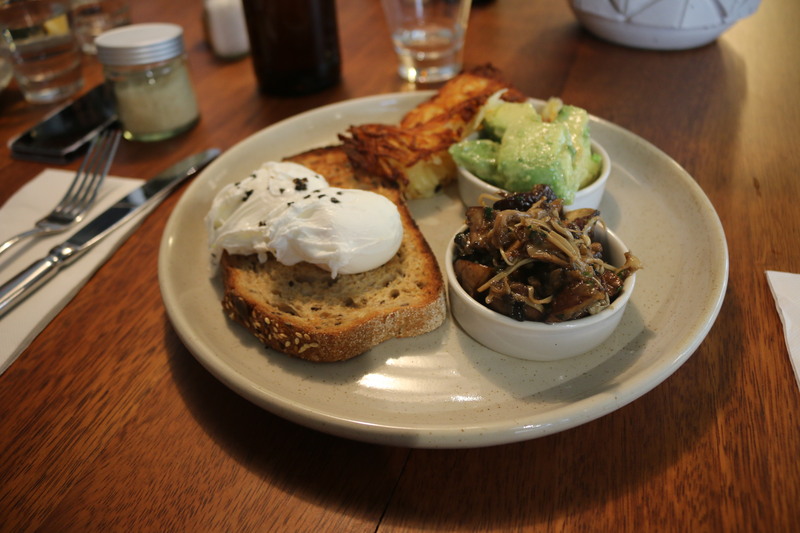 She got a side of mushrooms (mix of brown and enoki), avocado (big zesty chunks) and a potato rosti (golden crispy). Design your own big breakfast with a bunch of sides. 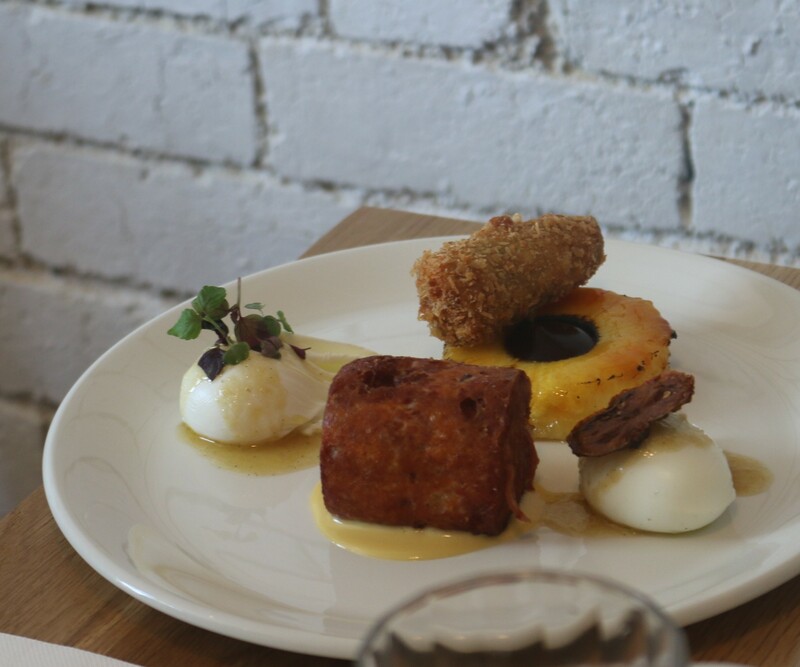 The ricotta fritters were fried and fluffy and was served with a beautifully fragrant lavender custard. Then there were strawberries in many forms. Juicy poached ones, dehydrated ones and a strawberry coulis. It was lovely. 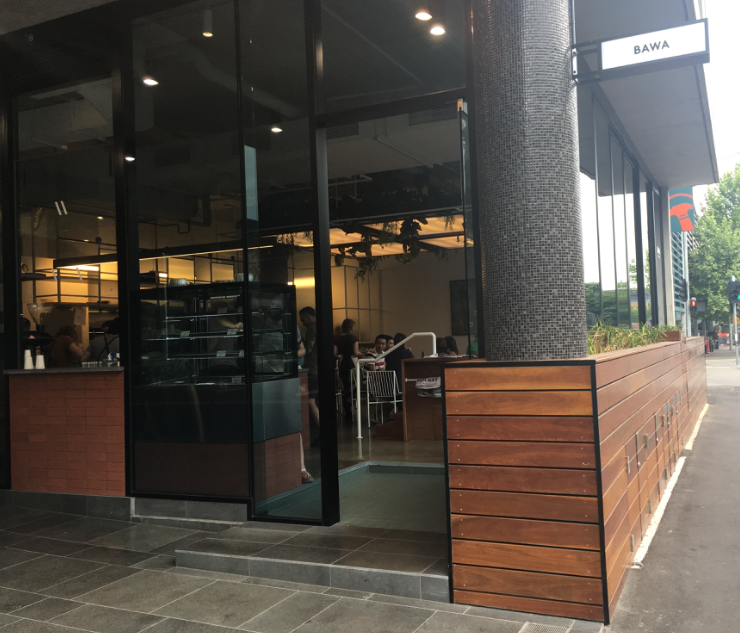 BAWA has a beautiful open atmosphere, a great place for catch-ups and brunch dates. There are lots of exciting items on the menu and the staff are lovely too. Pushing the boundaries and taking risks would be an understatement when it comes to brunching at Mammoth. With a lobster doughnut burger on the menu aside egg and bacon popcorn, it is definitely a place that will leave you amazed and inspired. 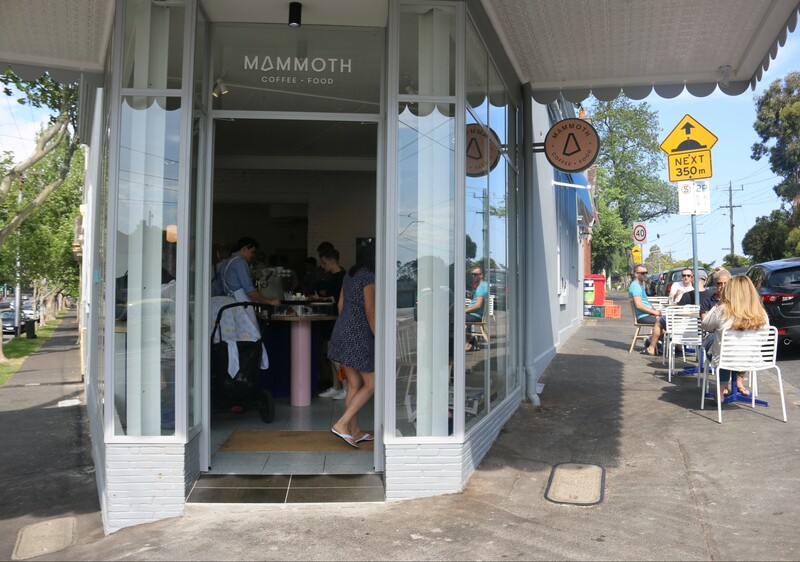 This café in Armadale was created by people from restaurants touchwood, barry, pillar of salt and hammer and tong (ahh it all makes sense). These distinguished foodie creatives have collaborated to execute these unimaginable dishes with confidence. Quirky and creative food that makes you go wow. 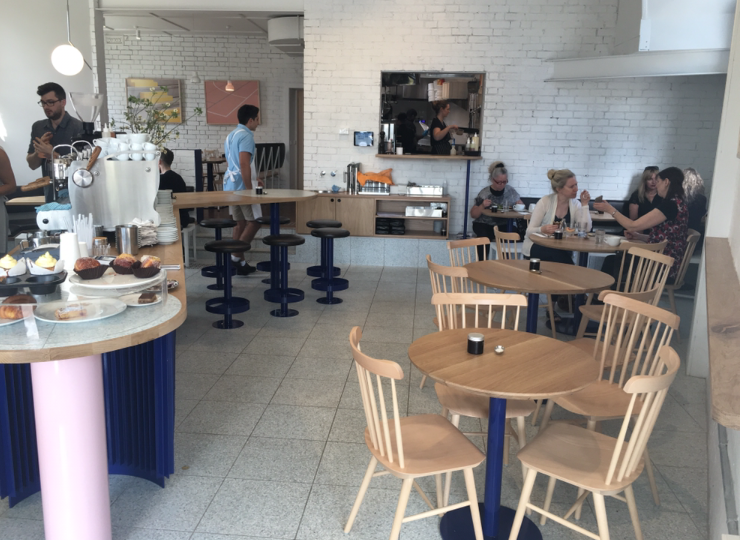 It’s bright inside with white brick walls, white hanging lights, light coloured wooden chairs and a few scattered artworks in pastels. It gives the atmosphere a cheerful and whimsical feel. The space is an odd shape, which is good for finding your own little space. 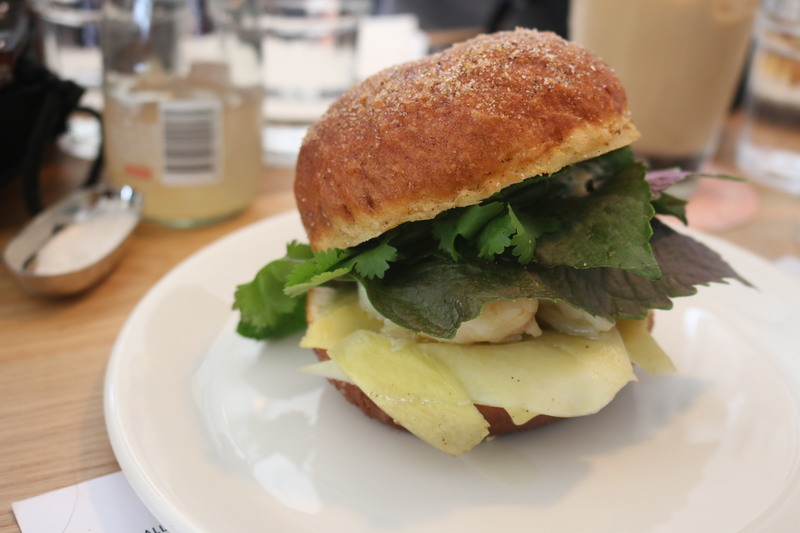 The lobster doughnut burger in its title holds a lot of curiosity. Could those three things co-exist on one plate and be delicious? I had to find out. And the verdict was…hellz yea they can. The doughnut was covered with salt and pepper (that totally looked like cinnamon sugar) and it was fluffy and soft in the middle but definitely more savoury of a doughnut than sweet. It was filled with big chunks of lobster with cucumber jam, sriracha mayo and some green mango and papaya slaw. A good combo of creamy and fresh. The egg and bacon popcorn was a delight. 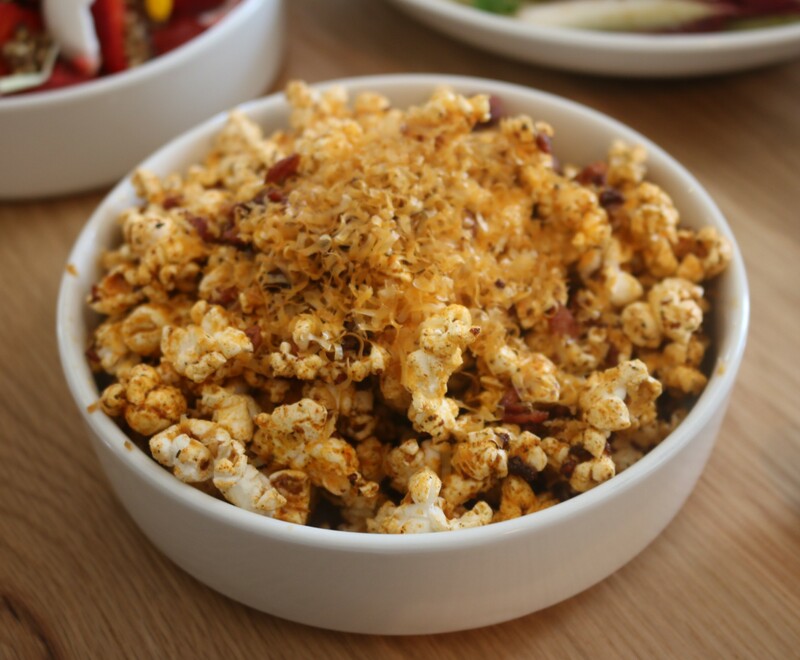 It tasted like popcorn as you know it with egg yolk and crispy bacon on top. It was so good and they got the right balance of topping because the popcorn wasn’t soggy and still had it’s light popping corn crunch. They need to get this popcorn into all cinemas asap. The coconut yoghurt custard was smooth and creamy and had a beautiful strawberry salad on top. 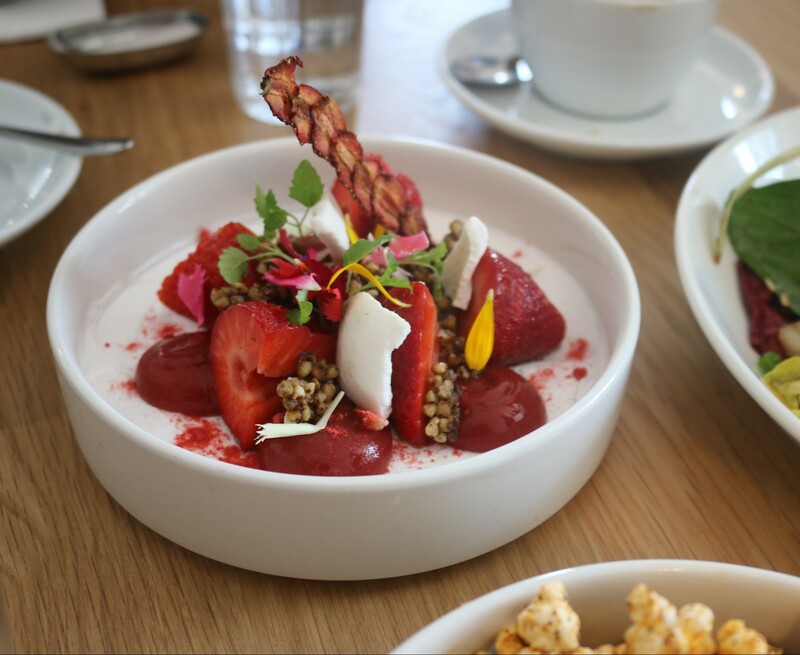 It looked like a garden of strawberries, so pretty with fresh strawberries and strawberry gel, crunchy buckwheat clusters, wattle seed granola and young coconut pieces. Lots of healthy stuff that make for one tasty meal. The benedict was interesting, not your traditional benedict. It was a sausage and egg blini with hollandaise, so good. 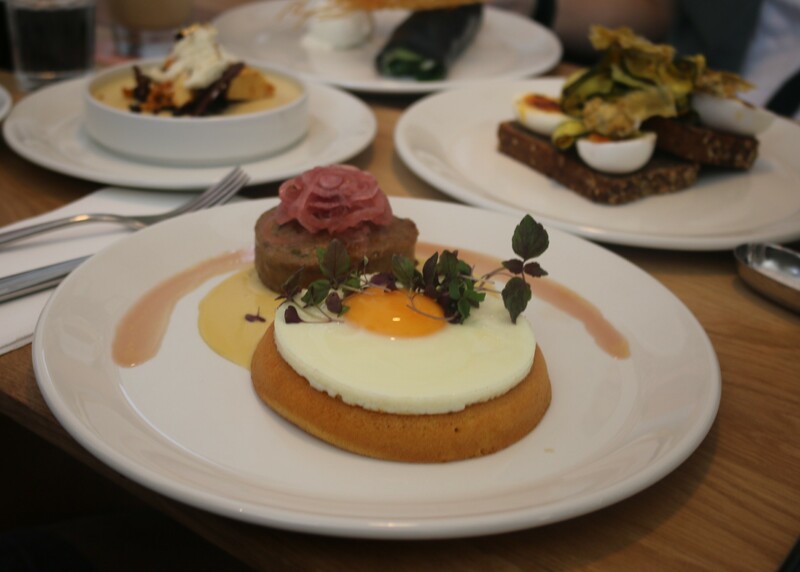 Fried duck sausage with pickled onion a fried egg on a orange and corn blini (like a pikelet) and smoked maple hollandaise. Delish. The eggs brulee were so cute with their little bruleed yolks. They were served with slithers of bread and butter pickled zucchini and crunchy bits of dried artichoke on seeded toast. Again not a combination I’ve ever seen before, but it works. The North shore had little bits of different things that work well. 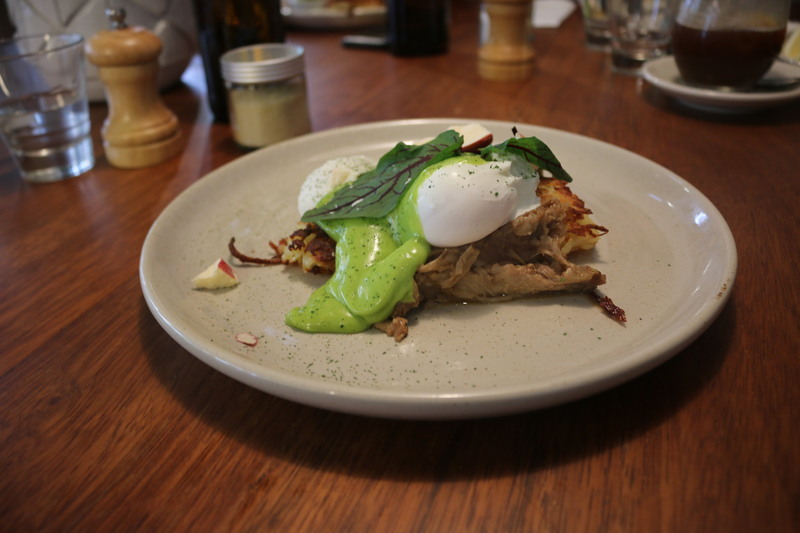 It had a smokey ham hock hash, flame grilled pineapple, tobasco, a jalepeno popper and poached eggs. Tasty. 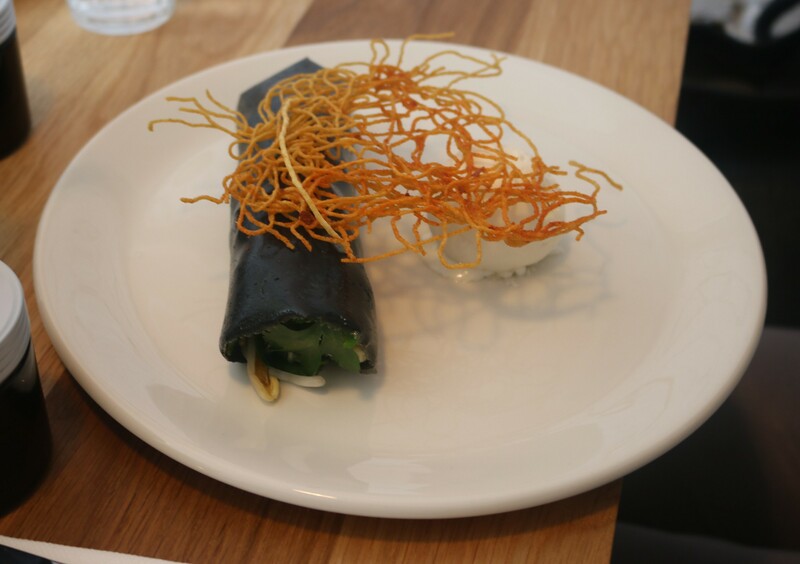 The Char spanner crab egg crepe was black and looked mysterious. It was filled with a bean shoot salad, water chestnuts and a scoop of lemon sorbet. Lots of fresh flavours. The chicken salad had lots of lovely fresh ingredients and various textures. 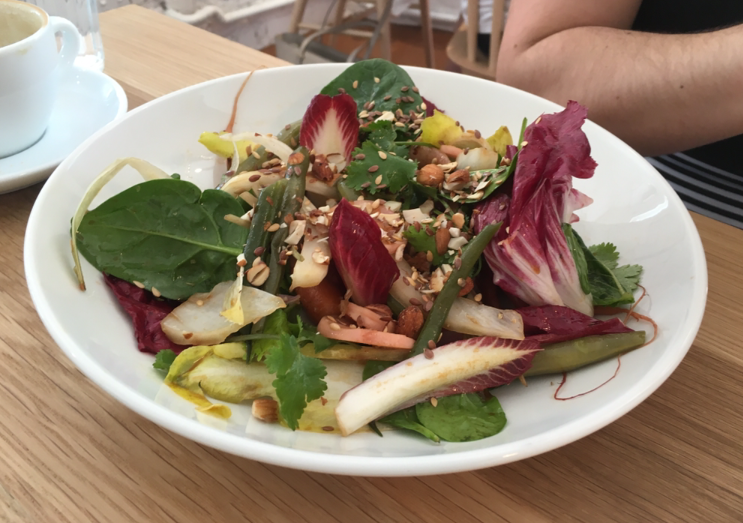 There was spinach, green beans, radicchio, almonds and fresh coriander in a well-balanced zesty sweet lime dressing. We had a gay ‘ol time with the Gaytime panna cotta. 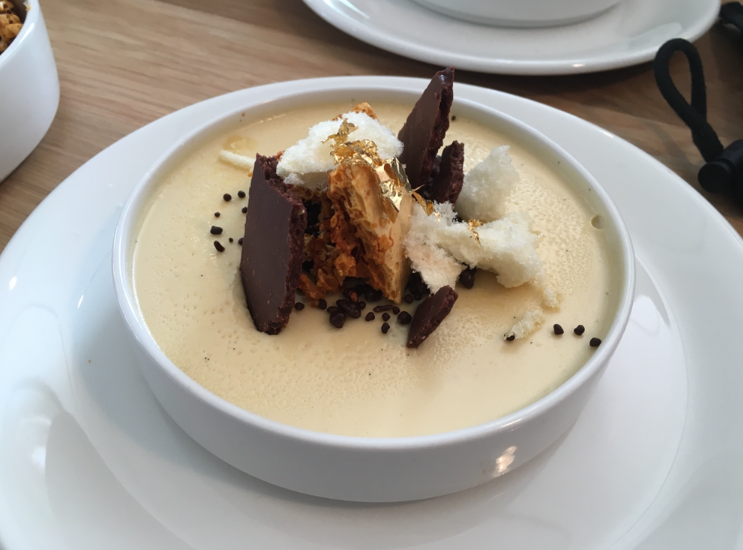 The toffee caramel panna cotta was incredibly smooth and creamy and was topped with popping candy chocolate, bits of honeycomb, biscuit pieces and a bit of gold leaf. It was a nice combination of textures. I love a bit of creativity in the kitchen especially when they get it right. 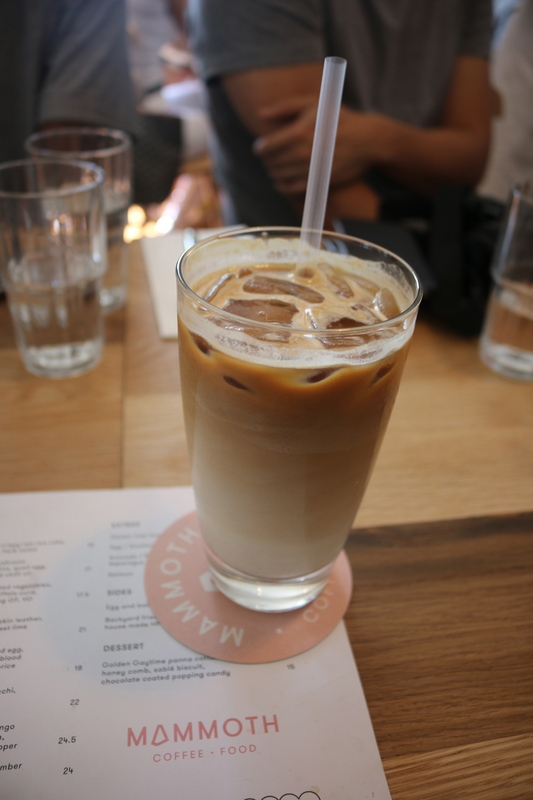 Mammoth is a great place to eat for breakfast or lunch and is especially good if you feel like something out of the ordinary and want to be inspired. Creative concepts executed well.